Twilight over the Sydney Opera HouseThe Sydney Opera House is a multi-venue performing arts centre in Sydney, New South Wales, Australia. 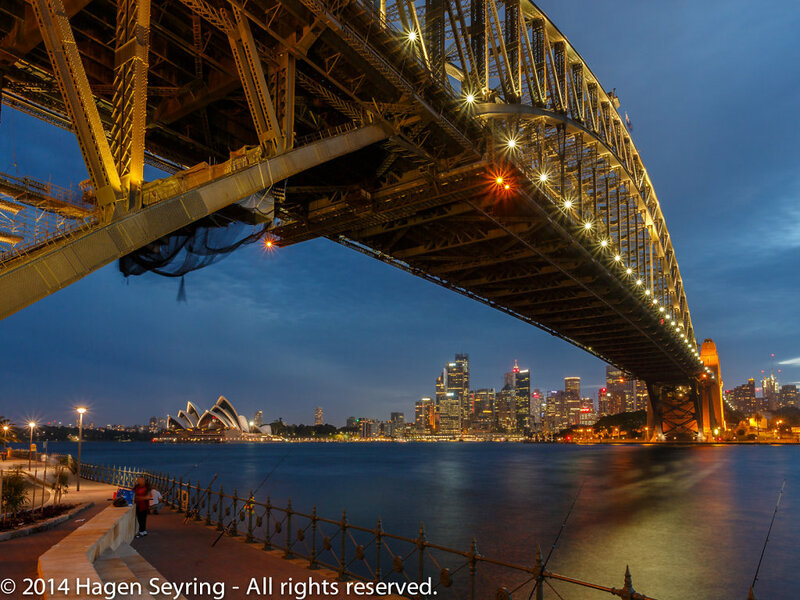 Situated on Bennelong Point in Sydney Harbour, close to the Sydney Harbour Bridge, the facility is adjacent to the Sydney central business district and the Royal Botanic Gardens, between Sydney and Farm Coves. Yes, I am here again. After a 24 hour journey I have arrived Sydney in the early Sunday morning. Exhausted, tired but happy. A half past nine I have arrived my old beauty victorian house from my B&B hosts in Darlinghurst. The feelings inside me were like coming home again, because all what i have seen on the taxi trip form the airport to the B&B were quite known. It feels like I have left Sydney only yesterday. Tom, my host, was welcoming me at the door. He wanted to show me the facilities again, but I told him that i know already all from the last year. The first thing i wanted to do was to get a sim card for my mobile phone. But it didn't work on this day because the system of the mobile phone provider didn't work on this day. So I decided to go to the circular quay on the feet of the Sydney Harbour Bridge to rest for a while. Then i recognized the upcoming jet lag from the long flight and the time zone change. I noticed that I wasn't able to do a lot this day and went home, had dinner very early in the Beresford Hotel and went to bed at 7 o'clock and slept until 4:30. After an 8 hours I couldn't sleep so that i decided to got to the Harbour bridge and to take some photos in in the sunrise. So I walked to the circular quay through the dawning City Sydney with a cappuccino on one hand and 2 croissants on the other hand, which I have bought on Pie Face a popular pie chain and the photo equipment on my bag, passing reveller who showed me naked skin and who asked me to take pictures from them, praying moslem between bistros against Mekka on the harbor and arrived it after 20 minutes. The sunrise didn't happen because it was to cloudy unfortinality. 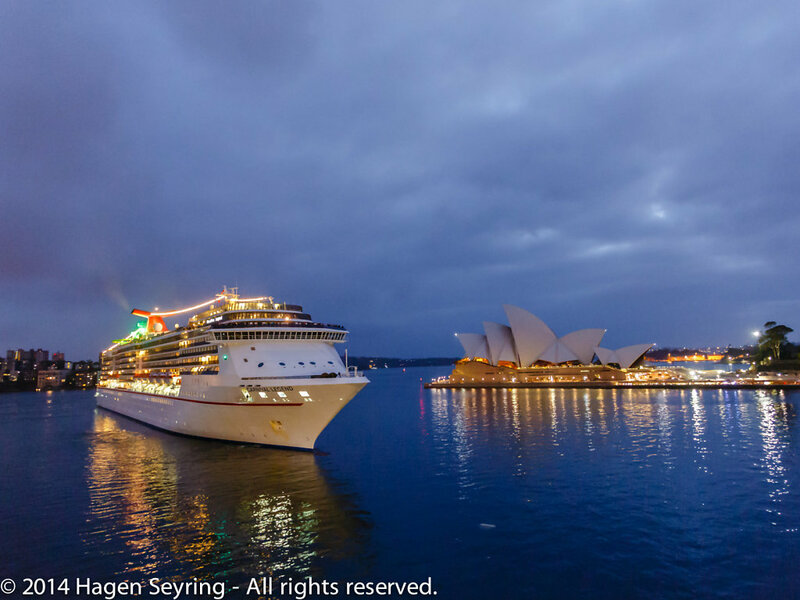 So I took some picture from the harbor and surroundings, as a cruisers came in the harbour. Cruiser passing the Sydney Opera HouseThe Sydney Opera House is a multi-venue performing arts centre in Sydney, New South Wales, Australia. 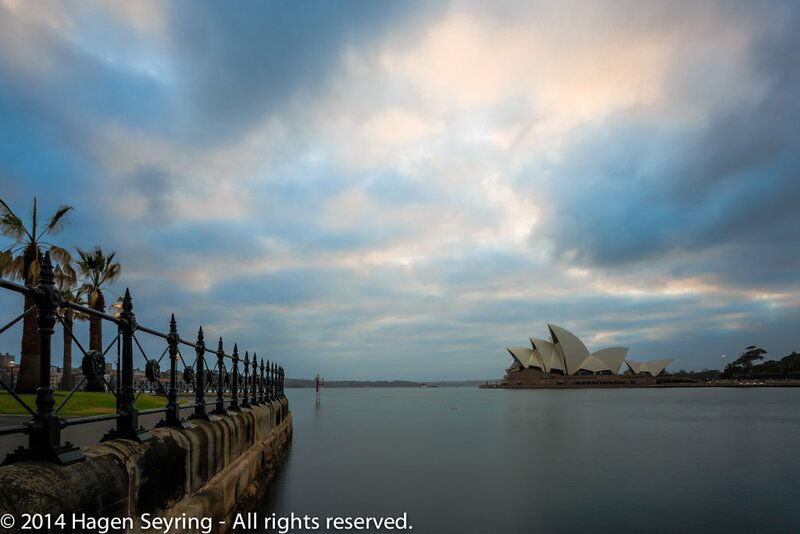 Situated on Bennelong Point in Sydney Harbour, close to the Sydney Harbour Bridge, the facility is adjacent to the Sydney central business district and the Royal Botanic Gardens, between Sydney and Farm Coves. After I came back in my B&B Tom and his boyfriend were sitting in the living room and were waiting for the breakfast, which were delicious like always. We were were chatting about anything, my travel plans about the football match which happened yesterday and the weather. Like i said it before. It was as i have left Sydney still only yesterday and was back. The first goal of the day was to get a australian prepaid card for my phone. As I was thinking afterwards about this, I was wondering how we are depending from these new technologies. Without these we are not able to communicate, to orientate and so on. I tried to remember how we have organized our trip to Colombia 20 years ago with some fellow students. But we did it without getting lost. 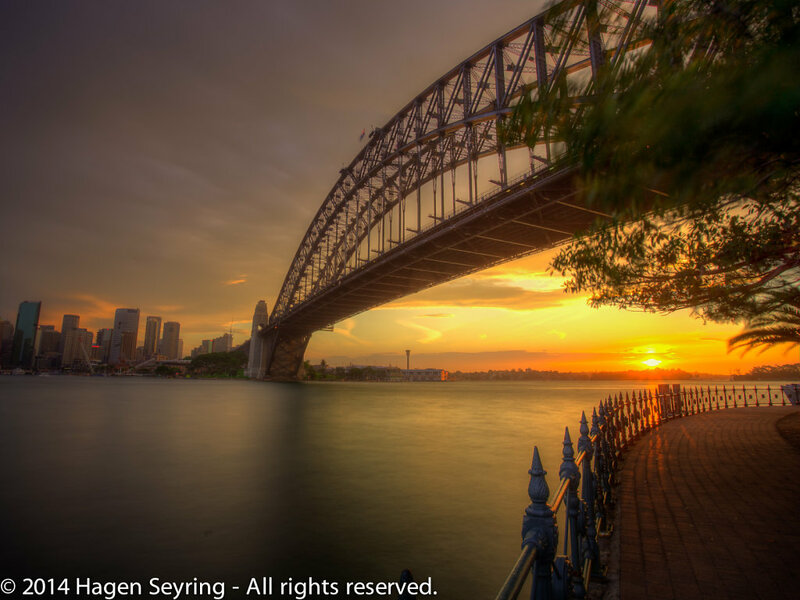 Sydney Harbour Bridge from the nothern side.The bridge is nicknamed "The Coathanger" because of its arch-based design. 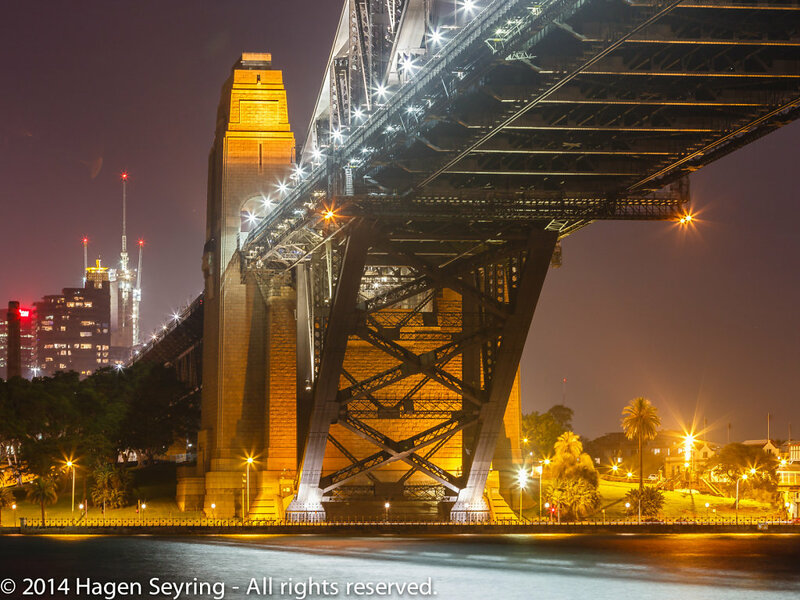 Furthermore, the bridge is ubiquitously known to Sydneysiders simply as "the Bridge". It was a beautiful area, a lot of people were sitting below the pylons of the bridge which tried to reach the sky majestic, to enjoy their labour day in the setting sun. There was a small Luna Park close to the feet of the bridge, where a lot of families with childrens were enjoying the day off. View to the Sydney Opera House from the northern sideThe Sydney Opera House is Australia's most recognisable building and is an icon of Australia's creative and technical achievement. 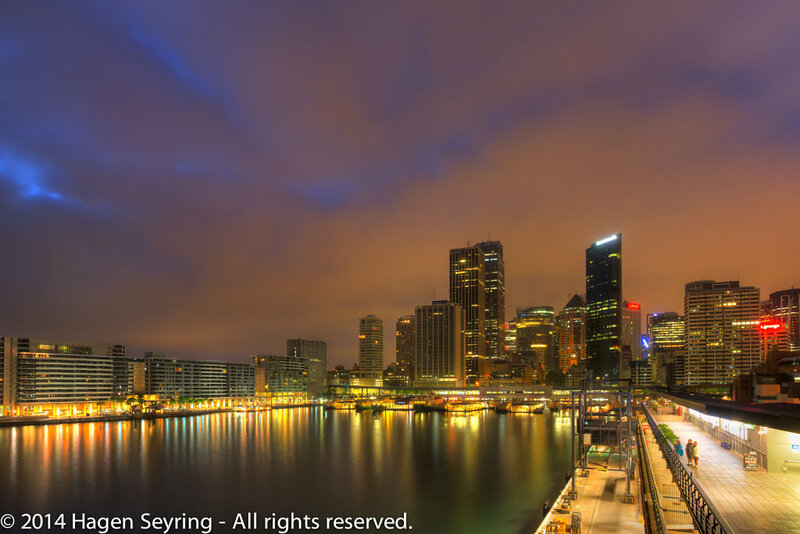 Since its completion in 1973 it has attracted worldwide acclaim for its design and construction, enhanced by its location on Bennelong Point within a superb harbour setting. So it was so wonderful here so I decided to stay here the whole evening to wait for the right light. There was a little restaurant on the beach, where I had a coffee and wine between something, Some families we're standing on the habour and were trying to harvest fishes, but i guess this wasn't not the main reason. Pylon of the Sydney Harbour BridgeAt each end of the arch stands a pair of 89 m (292 ft) high concrete pylons, faced with granite.The pylons were designed by the Scottish architect Thomas S. Tait,a partner in the architectural firm John Burnet & Partners. After the sunset the twilight felt and brought a wonderful light so that i could I cacht some beautiful captures which you can see below. Yesterday i decided to go to Manly. Manly is a harbour- and ocean-side suburb and locality of Sydney and the southernmost of Sydney's Northern Beaches. 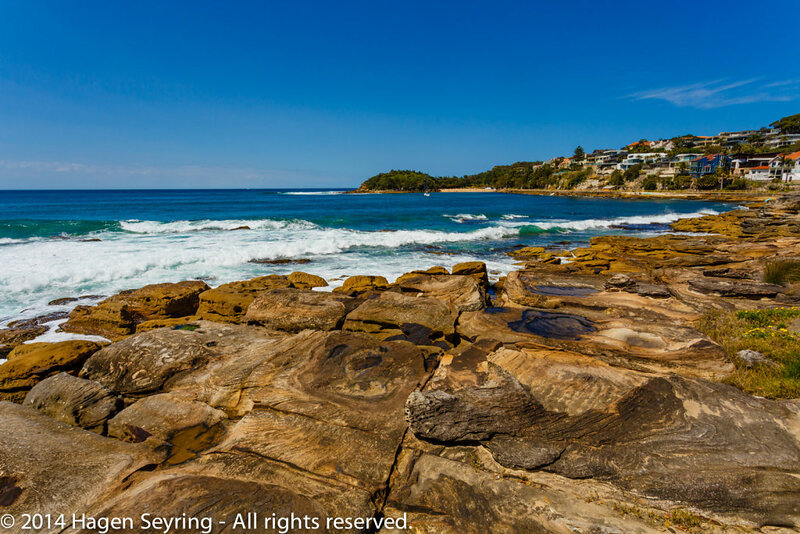 Scenic walk way on ManlySituated across the Harbour 11 km (7 mi) north-east of Sydney City on the lower Northern Beaches, Manly was named by Captain Arthur Phillip after his encounter with the confident and manly Aboriginal people who lived on the peninsula. 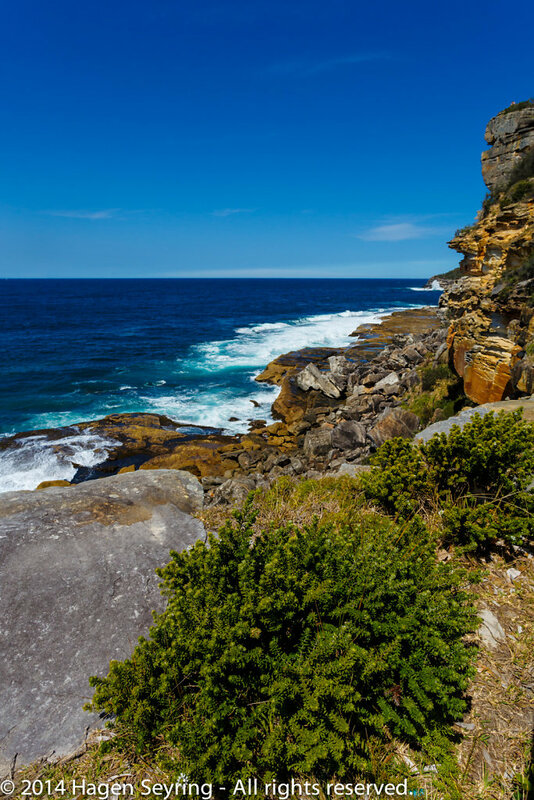 Manly scenic walk way - Cliff coast on ManlyThis epic 10km, four-hour walk tracks west from Manly through rugged Sydney Harbour National Park – wear sturdy shoes. It’s easy to forget you’re right in the middle of Sydney! 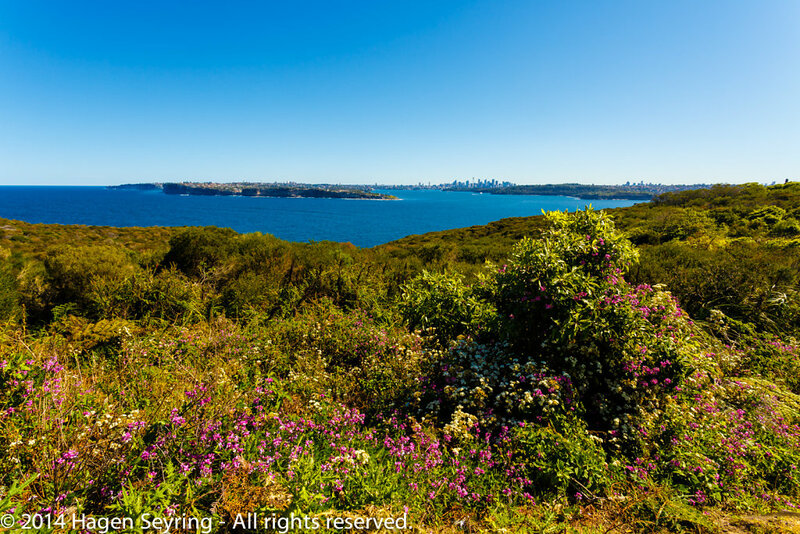 Scenic walk way on Manly - Bush walk on ManlyThis epic 10km, four-hour walk tracks west from Manly through rugged Sydney Harbour National Park – wear sturdy shoes. It’s easy to forget you’re right in the middle of Sydney! 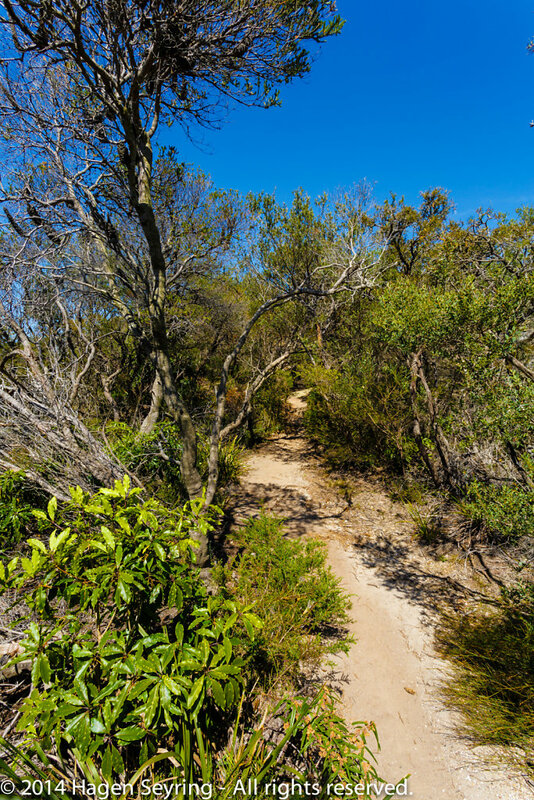 Scenic walk way on Manly - The rest from a bush fire on ManlyThis epic 10km, four-hour walk tracks west from Manly through rugged Sydney Harbour National Park – wear sturdy shoes. It’s easy to forget you’re right in the middle of Sydney! 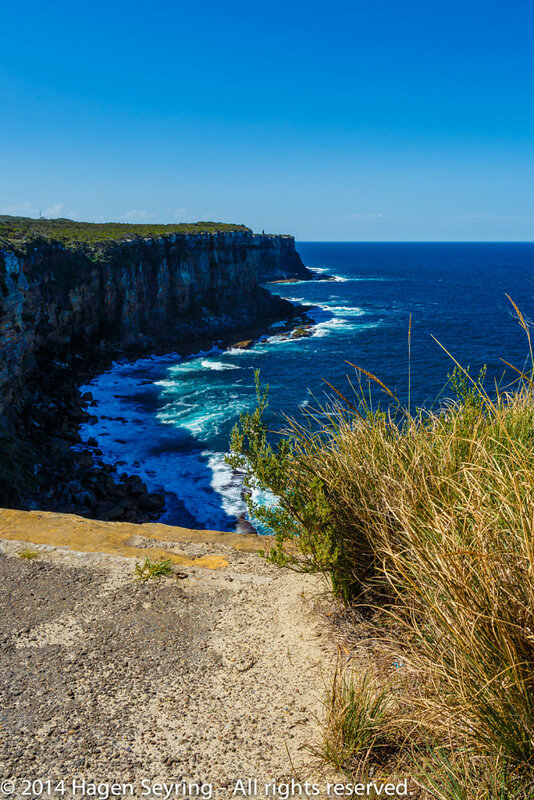 Scenic walk way on Manly - Steep cliff coast on ManlyThis epic 10km, four-hour walk tracks west from Manly through rugged Sydney Harbour National Park – wear sturdy shoes. It’s easy to forget you’re right in the middle of Sydney! along steep beautiful cliff coast and with a great view across the harbor to Sydney. After a very relaxing day yesterday in Sydney, I started my first step of my Australia in the Red Center to Alice Springs. After a good breakfast made freshly from Tom, he baked a america breakfast cake today, the xi pickend me up at 8:15 o'clock to the Airport where my flight from Sydney to Alice Springs started at 09:50 o'clock. I have been very excited to go there. I don't know exactly why, may I was a little bit anxious of the heat in the desert or something else. But i recognized it i n my stomach. The flight took 2 hours and 40 min over a distance from around 2000 km. 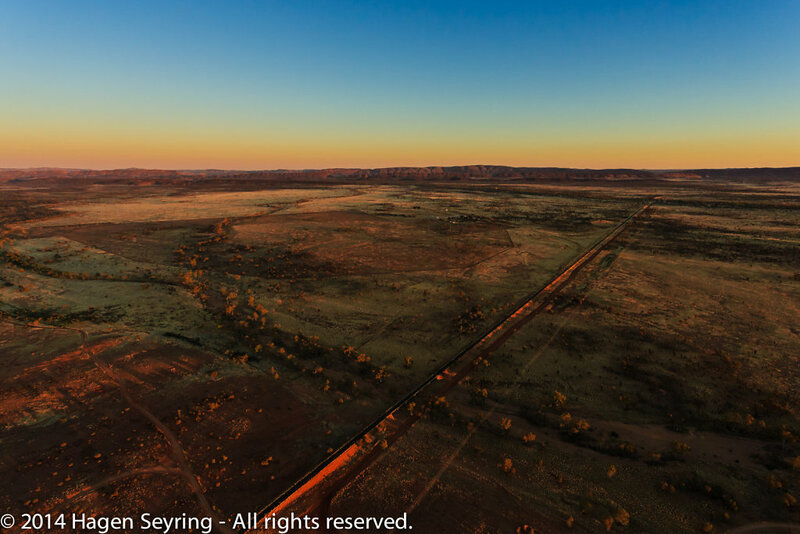 And it was very interesting how the surface of the earth was changing from green covered landscape like fields and mountain after the start in Sydney to a rusty shades of brown plain as we were landing in Alice Springs. The climate was very hot and dry. Around 32 degrees and only 5% humidity in the air. I had the feeling that whilst i was breathing my mouth was running dry because the air took all the humidity from my moth mucosa. After i have received my baggage a airport shuttle took me the my hostel Alice Secrets Travellers in. Another room in Alice SecretsThe smallest hostel in the Alice, are tucked away in a quiet street just opposite arid bush land and Botanic Gardens, yet only a five minute walk from the town centre. 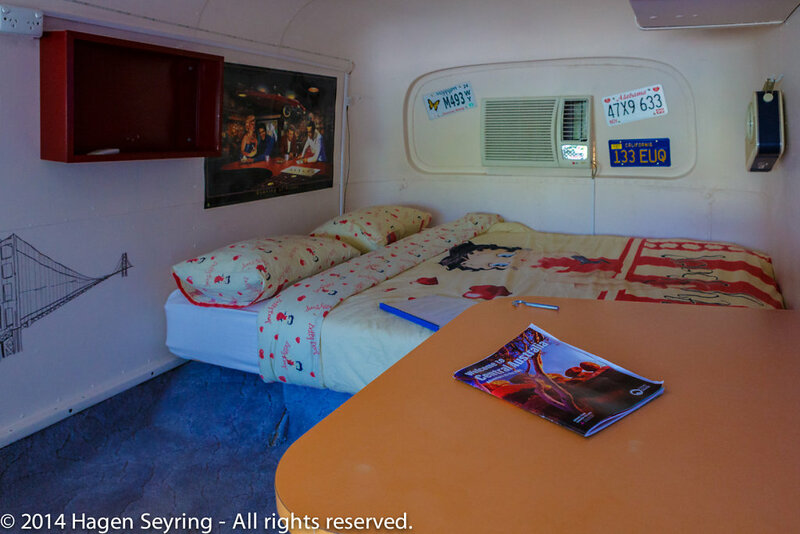 or like my room in a disused camper. But it doesn't disturb me, because i knew what i have booked before. 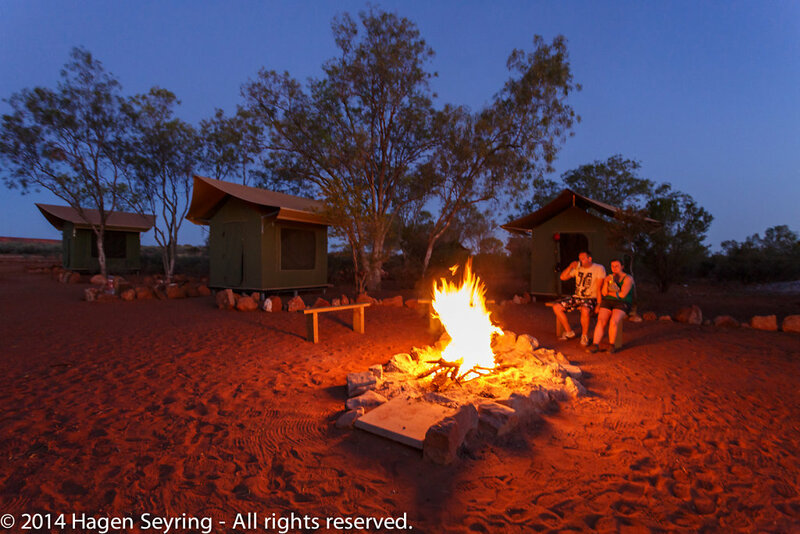 Then the hotel prices in Alice Springs not the cheapest ones. After i had organized myself I felt to go shopping some food an especially something to drink in one of. So walked through the dry hot climate through the dried-out river bed at noon the shopping center. And it was really hot. During my walk I was watching all the aboriginal people who are sitting under the trees of the dried-out Todd River not really taken part on the social life of Alice Springs. 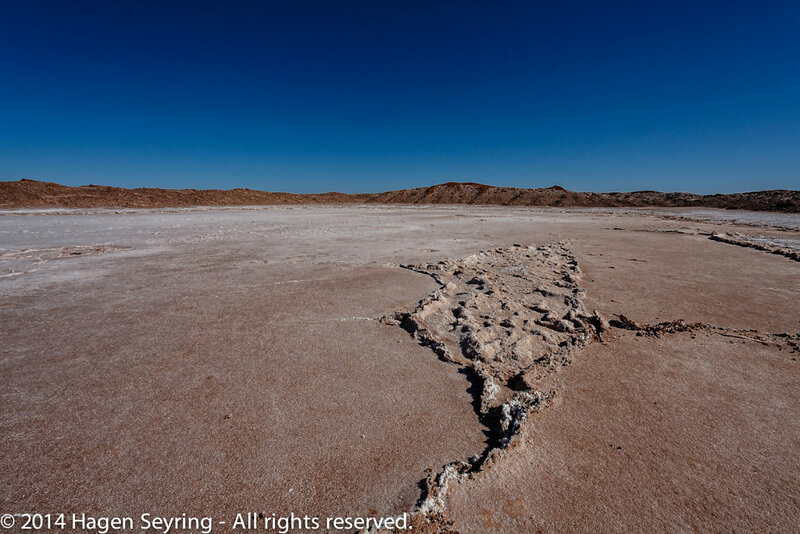 Dried-out Todd River bedThe Todd River is an ephemeral river in the southern Northern Territory, central Australia. 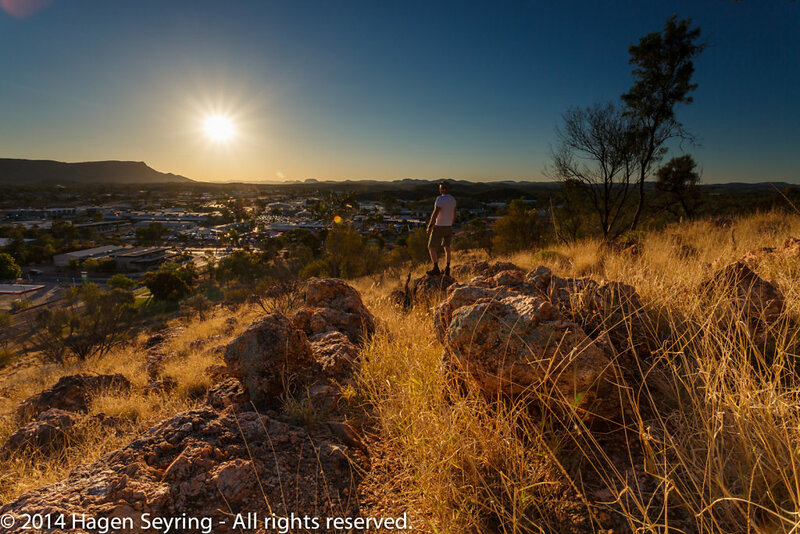 Before Sunset I decided to mysef to go to as small hill called Anzac Hill from which you should have a good view across Alice Springs. And it was it worth it. 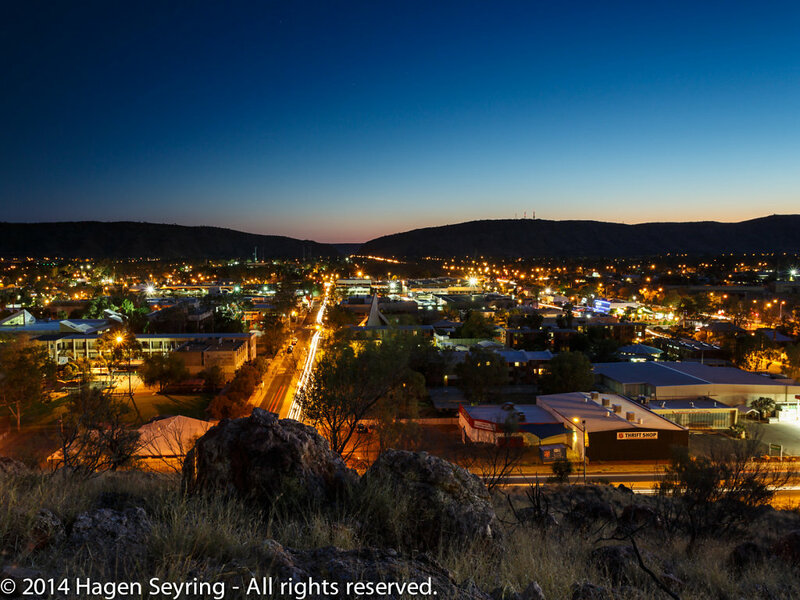 View over Alice SpringsAlice Springs (Arrernte: Mparntwe) is the third largest town in the Northern Territory, Australia. 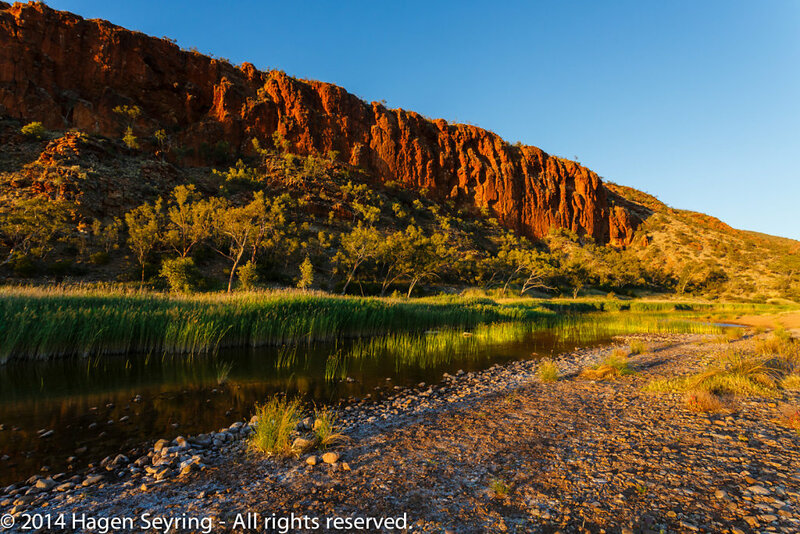 Popularly known as "the Alice" or simply "Alice", Alice Springs is situated in the geographic centre of Australia near the southern border of the Northern Territory. So I was waiting here for the sunset of the day and enjoyed the play of colors on the sky until the twilight came. 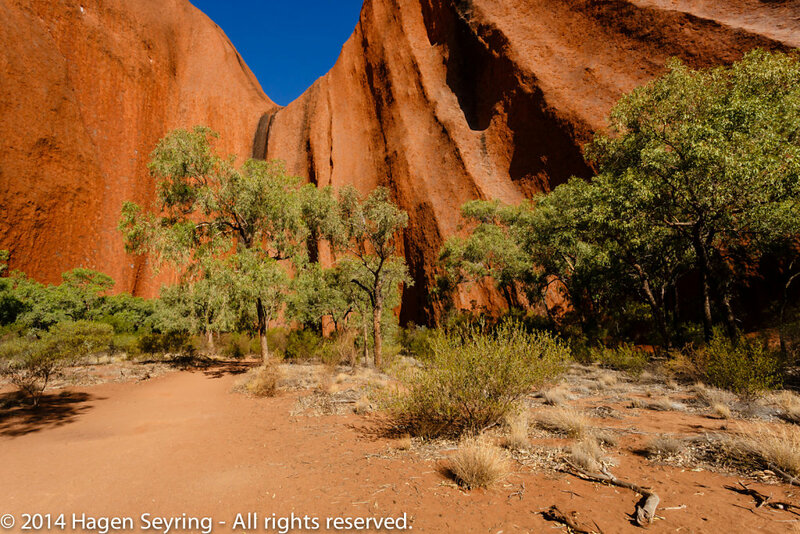 Sandstone formation with a treeUluru (English pronunciation: /ˌuːluːˈruː/), also known as Ayers Rock and officially gazetted as Uluru / Ayers Rock,is a large sandstone rock formation in the southern part of the Northern Territory in central Australia. 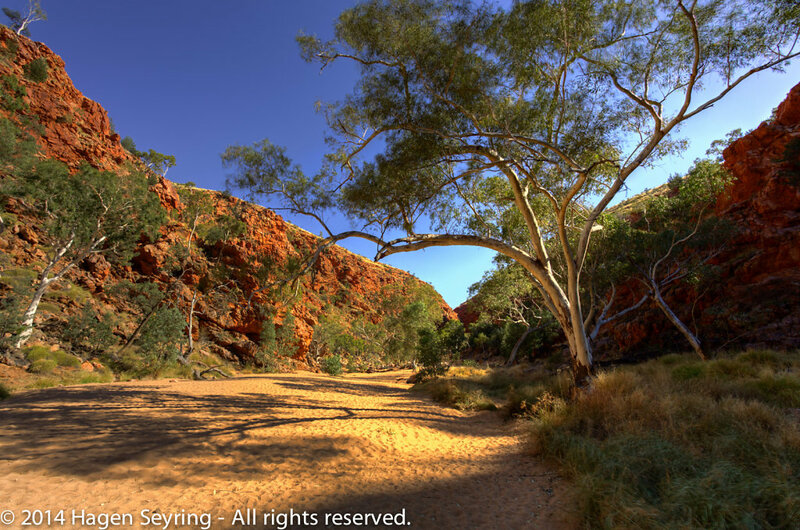 It lies 335 km (208 mi) south west of the nearest large town, Alice Springs, 450 km (280 mi) by road. Wow the first night in my camper was really cold. I have often read that in a desert whilst is very hot during the day it can get very cold in the night. But if it happens surprisingly in reality, nevertheless you are wondering. 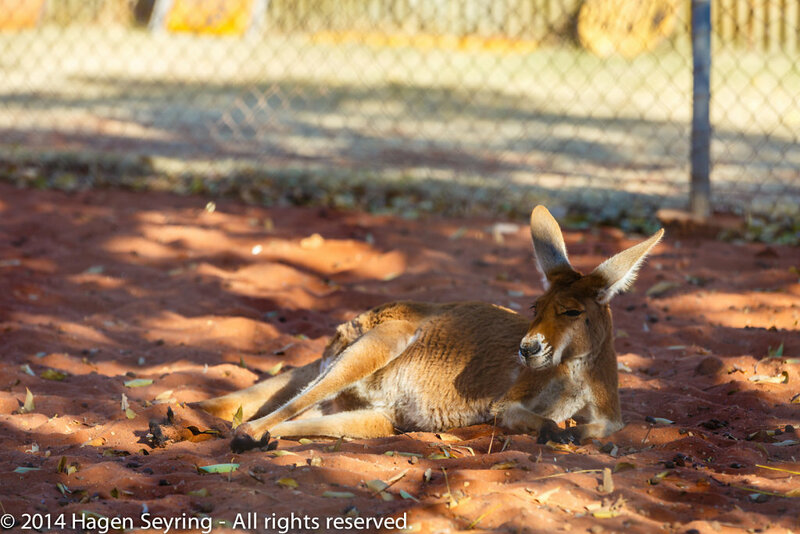 Today it's time for the Kangaroo Dreamimg Safari. Unfortunality i had to get up very early at 5 o'clock, and all of you who get to know me. IT'S NOT MY TIME. But if you want to experience something new you have to make compromise. 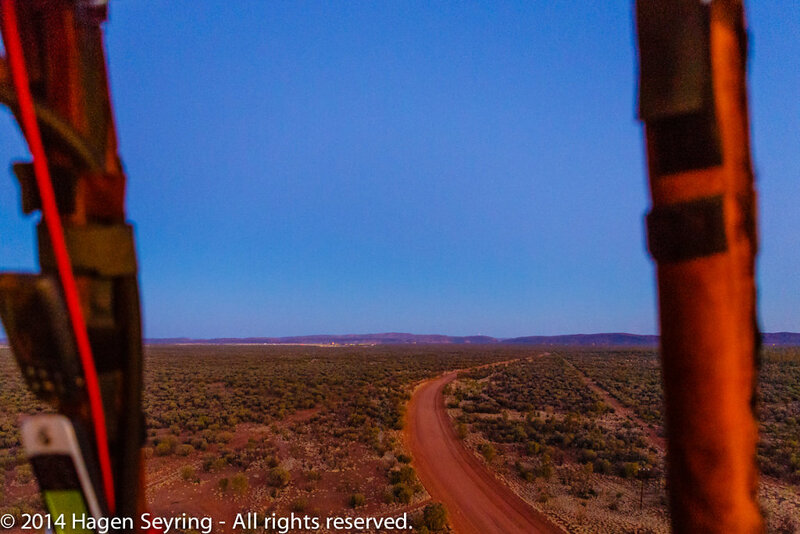 The 4wd bus picked me up at 6, After picking up of some other guests, we have left Alice Springs in the Stuart Highway in a southern direction. The shade of brown painted hills, which are surrounding Alice Springs, were dipped in a beautiful warm light from the rising sun. Wether I thought the Red Center is rather a Desert than a jungle, there are a lot bushes and trees are growing here, so the the hills were dabbed with small green bushes what builds a nicely contrast to the brown color of the hills.Our journey went further through endless driet-out bush land on this early morning for hours. Nothing else like bush land until to the horizont. I do not want to have an engine damage on this street, where you meet only every 4 or 5 hours another car. Only l up and off a herd of cows beside the street. 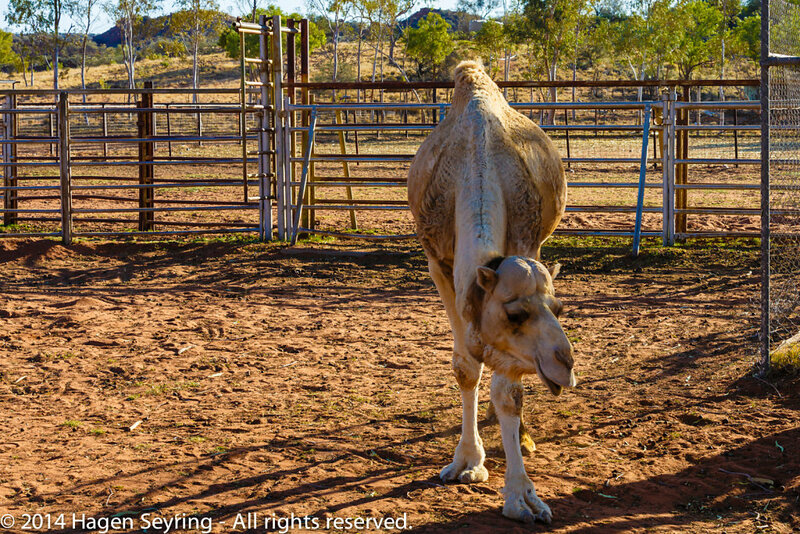 Outback Camel FarmAs camels were ideally suited to the hot, dry climate of Australia's interior, they were imported in the 19th century and remained the principal means of outback transport until railways and roads were established. Our first stop after 2 hours was a camel farm for having a snack , coffee or a ride on a camel. Camels were very important for the infrastructure provision of the outback. 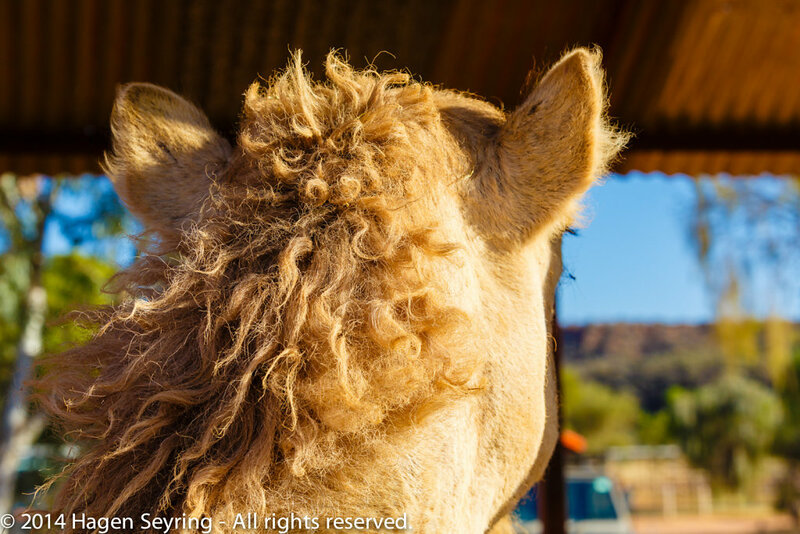 A camel from the backAs camels were ideally suited to the hot, dry climate of Australia's interior, they were imported in the 19th century and remained the principal means of outback transport until railways and roads were established. 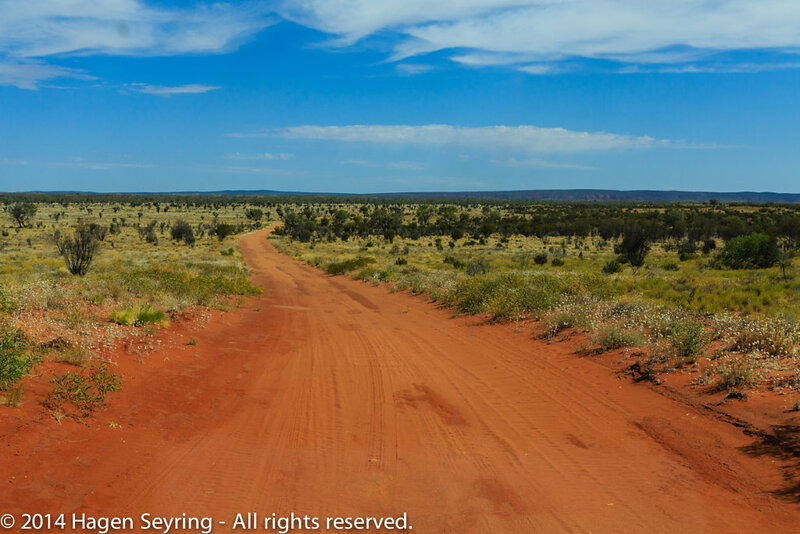 And whether it is very comfortable to go over sealed road from Alice to Uluru today, Around 150 years before there was nothing here. 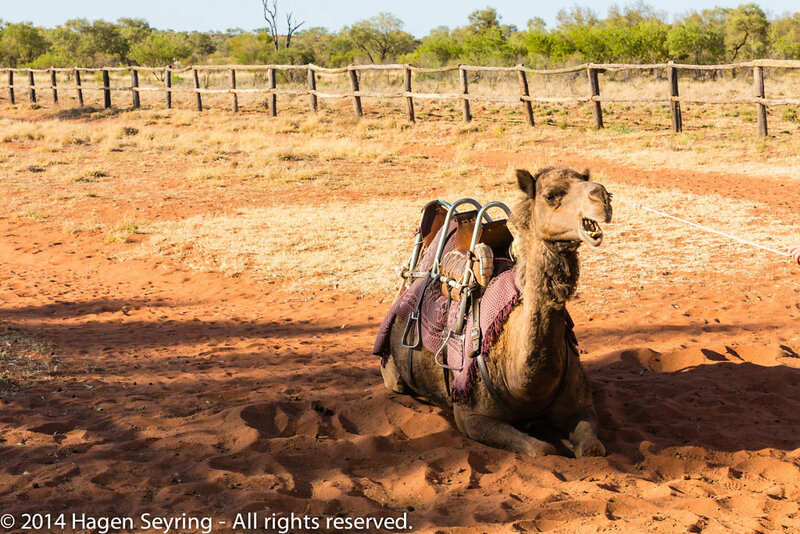 A camel which doesn't restist to stand upAs camels were ideally suited to the hot, dry climate of Australia's interior, they were imported in the 19th century and remained the principal means of outback transport until railways and roads were established. So the camels were used to get all the building material, food and water in the outback to to build up the streets and so on. And everybody knows that camel are very modest to survive in the desert. 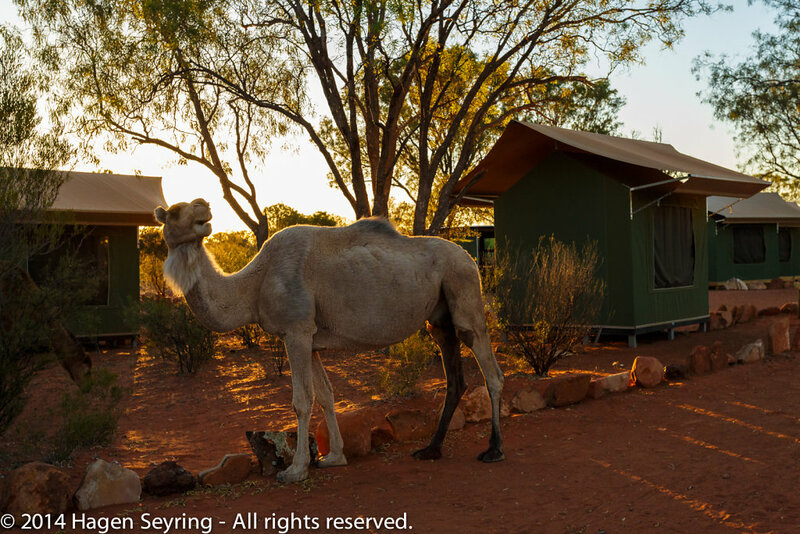 Camel in the Outback Camel FarmAs camels were ideally suited to the hot, dry climate of Australia's interior, they were imported in the 19th century and remained the principal means of outback transport until railways and roads were established. There were also kangaroos and emus on the farm. Kangaroo in the Outback Camel FarmAs camels were ideally suited to the hot, dry climate of Australia's interior, they were imported in the 19th century and remained the principal means of outback transport until railways and roads were established. After the break the journey continued, but the landscape didn't change. Still bush land on brown soil until the horizontal. You will be tempted to look for a house or something similiar which could be a sign for a civilisation on the horizont but you won't find it. 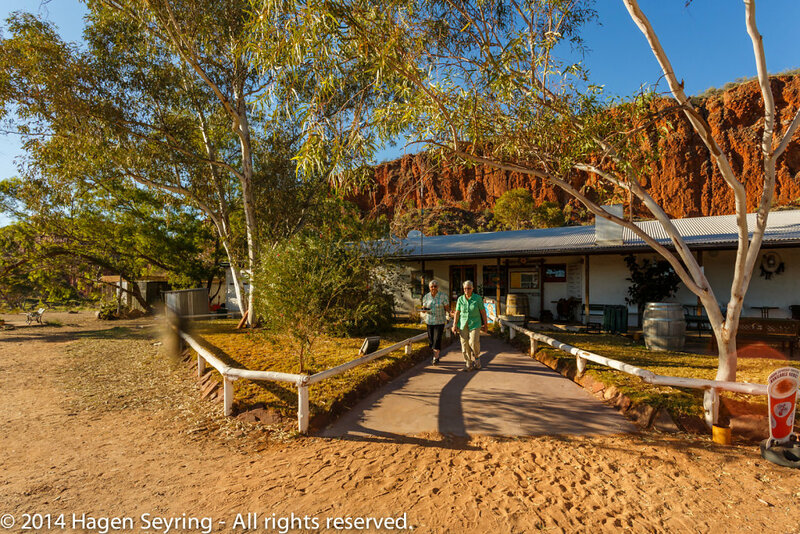 Next stop was at Mt Ebenezer Roadhouse to have a break for toilet, have a coffe or for a visit of an aboriginal art exhibition. Mount Ebenezer RoadhoauseMt Ebenezer Roadhouse is owned and run by the Imanpa Community. 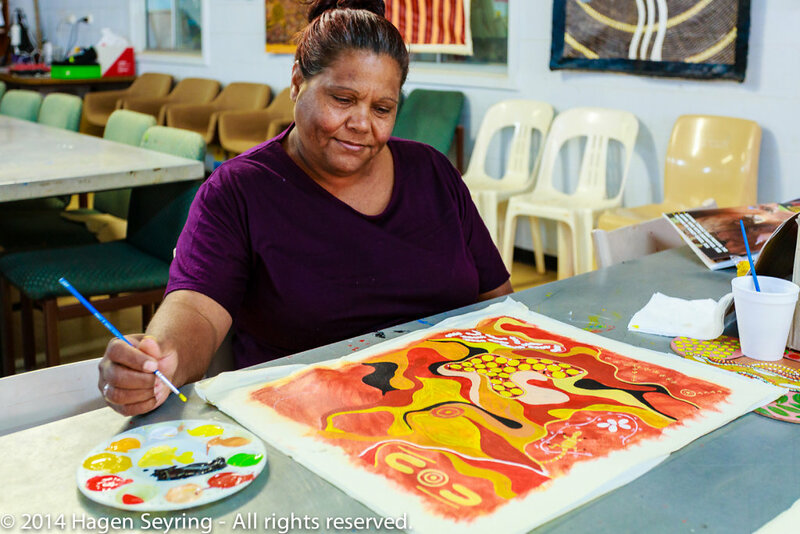 In this exhibition you can see the typical art work from the aborigines, whilst they worked on new things in the back room. As I came in they have noticed me and exchanged glances. In the gallery were hanging profiles of the different aboriginal artists. But an assistance noticed me and asked me not to take any photos. I had a feeling I shouldn't disturb the artist during doing their work and not to talk with them. The whole situation felt like a sheltered workshop, whether I was sure that the aborigines weren't mentally disabled but it looks like they were threatened in this way. So was asking myself who is protecting whom here. 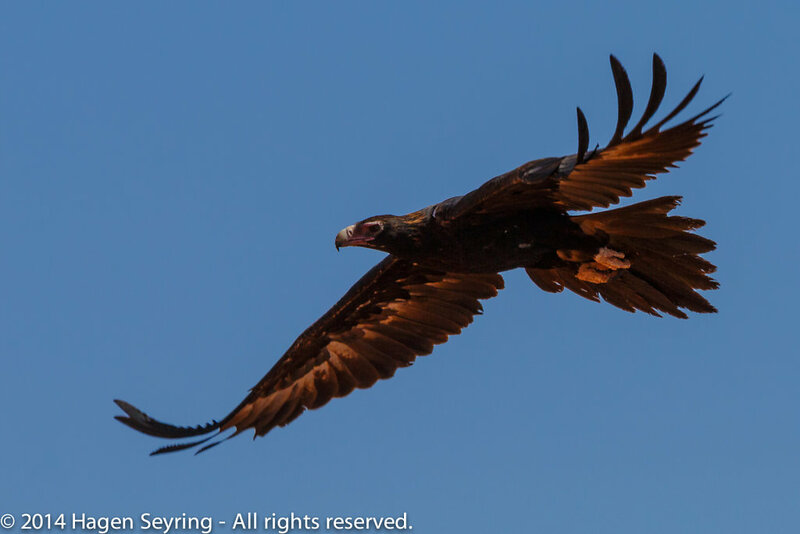 Eagle at the Mt Ebenezer RoadhouseAs well as offering accommodation, food, petrol and the usual roadhouse services, Mt Ebenezer is also an outlet for the artwork produced by members of Imanpa community. I don't mention it by the way. Our air condition wasn't working during the trip from Alice to Uluru. And it's still getting hotter now.!!!! 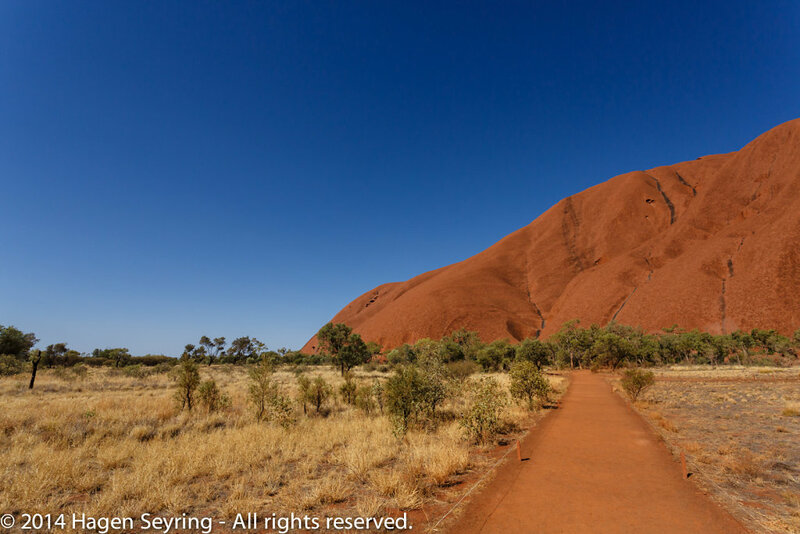 The main entry through the walk around the UluruUluru (English pronunciation: /ˌuːluːˈruː/), also known as Ayers Rock and officially gazetted as Uluru / Ayers Rock,is a large sandstone rock formation in the southern part of the Northern Territory in central Australia. 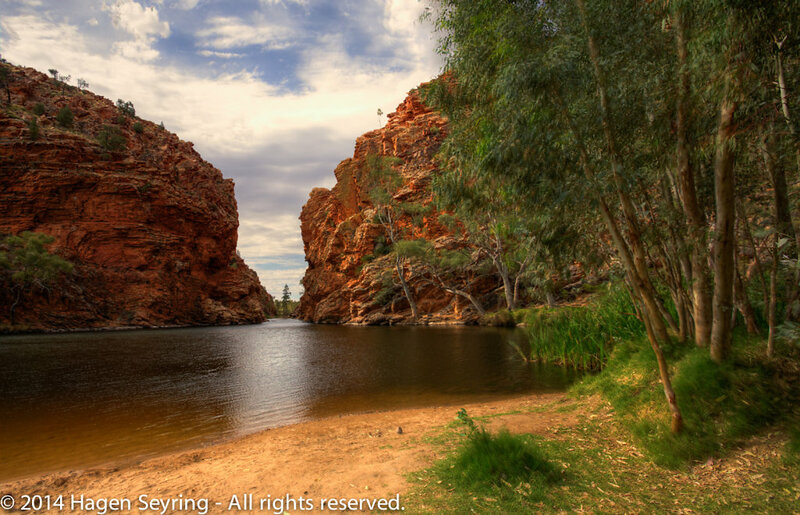 It lies 335 km (208 mi) south west of the nearest large town, Alice Springs, 450 km (280 mi) by road. Finally we have arived the majestic Stone in the desert. 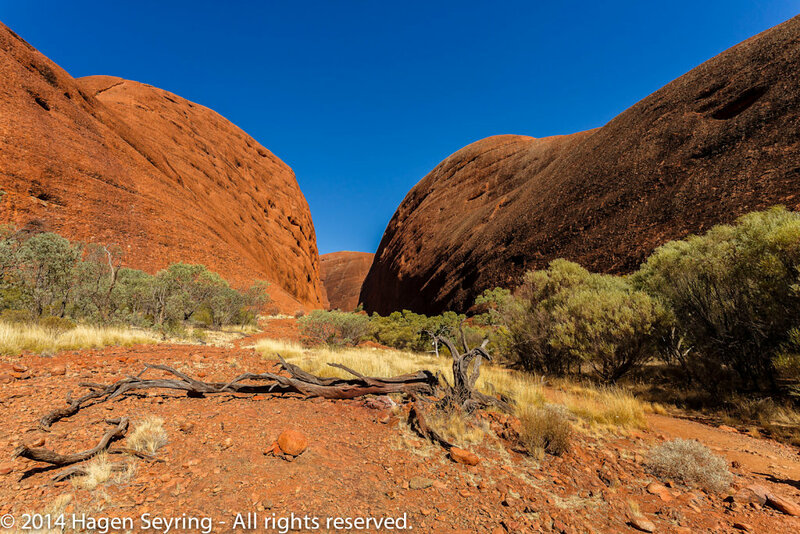 A large sandstone formation of the UluruUluru (English pronunciation: /ˌuːluːˈruː/), also known as Ayers Rock and officially gazetted as Uluru / Ayers Rock,is a large sandstone rock formation in the southern part of the Northern Territory in central Australia. 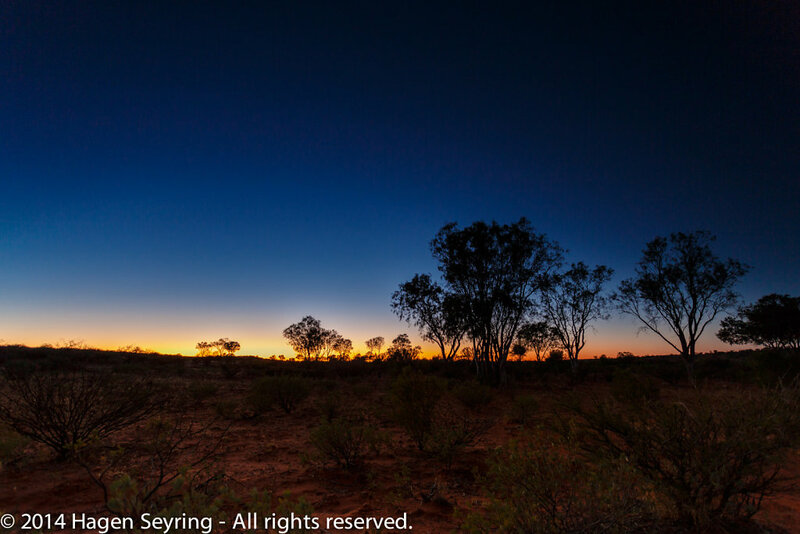 It lies 335 km (208 mi) south west of the nearest large town, Alice Springs, 450 km (280 mi) by road. 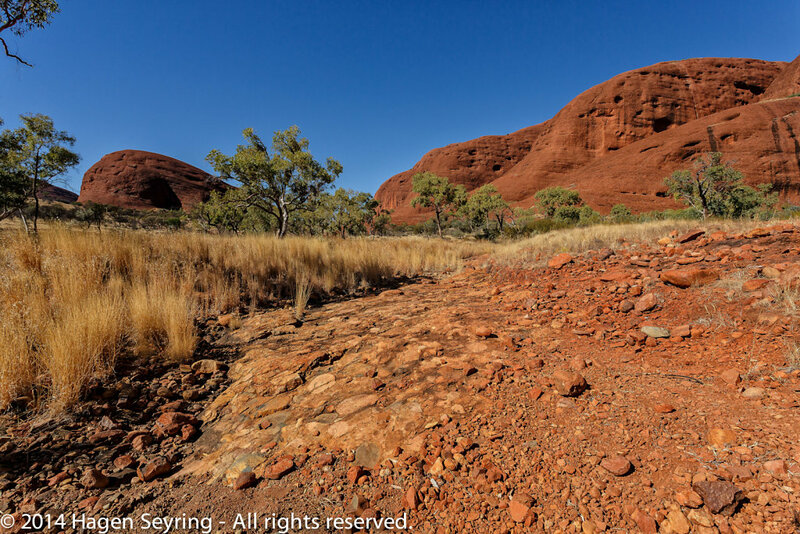 We were walking a short walk, because of the hot weather beneath the rock while the tour guide was explaining the genesis of the stone and a lot of stories about the Uluru which the aborigines have given from one generation to another. 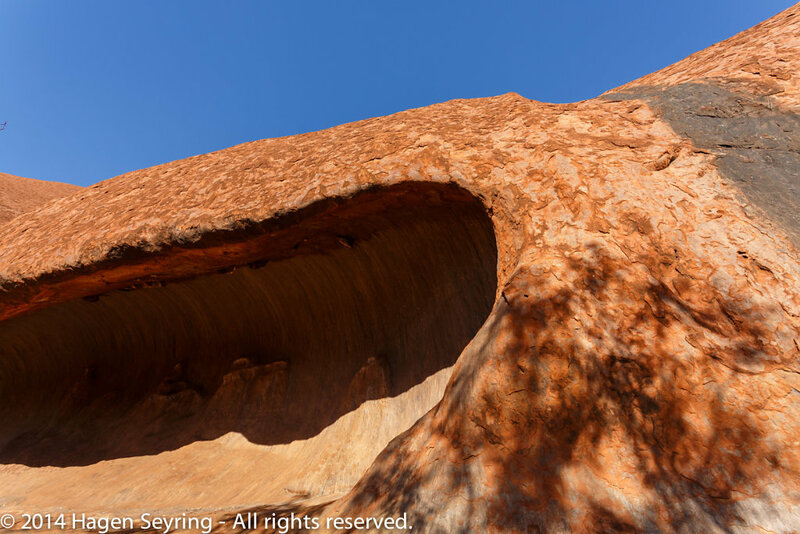 A cave on one side of the Uluru with drawings of AboriginesUluru (English pronunciation: /ˌuːluːˈruː/), also known as Ayers Rock and officially gazetted as Uluru / Ayers Rock,is a large sandstone rock formation in the southern part of the Northern Territory in central Australia. 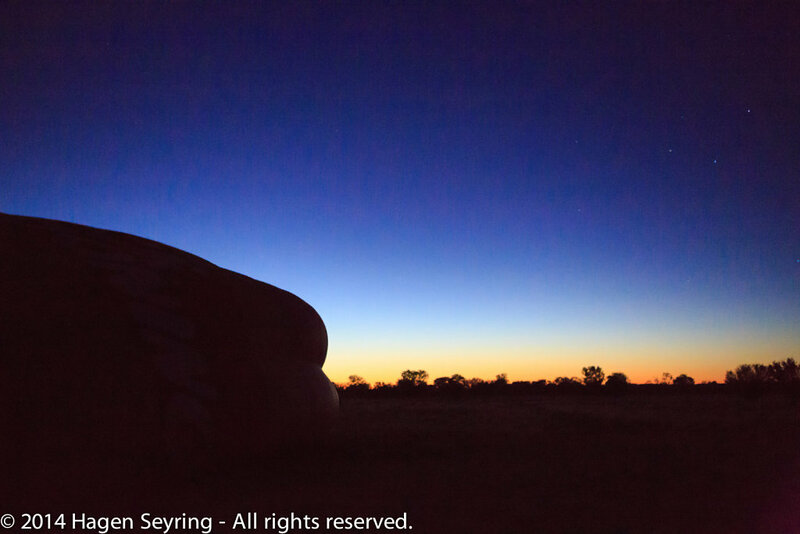 It lies 335 km (208 mi) south west of the nearest large town, Alice Springs, 450 km (280 mi) by road. 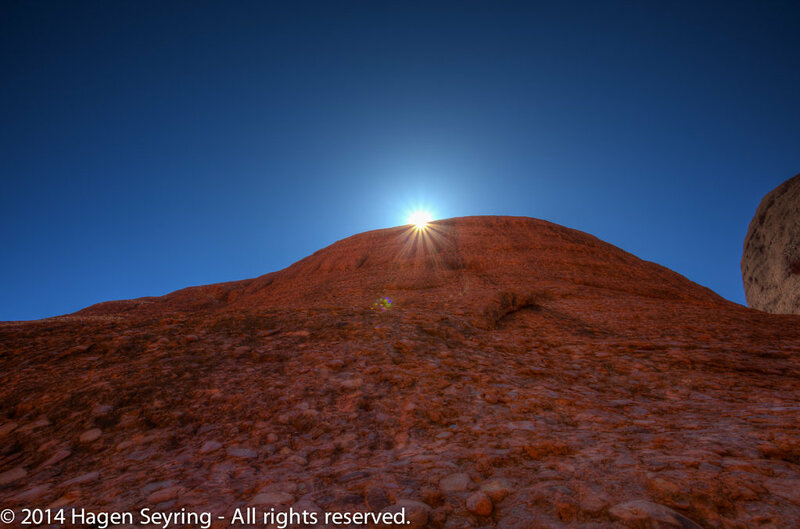 The Uluru is really beautiful. 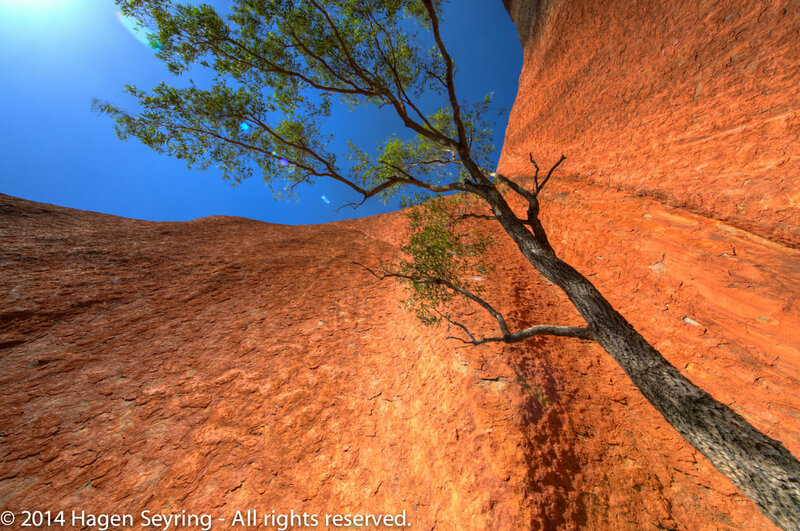 Steep rock formation of the UluruUluru (English pronunciation: /ˌuːluːˈruː/), also known as Ayers Rock and officially gazetted as Uluru / Ayers Rock,is a large sandstone rock formation in the southern part of the Northern Territory in central Australia. 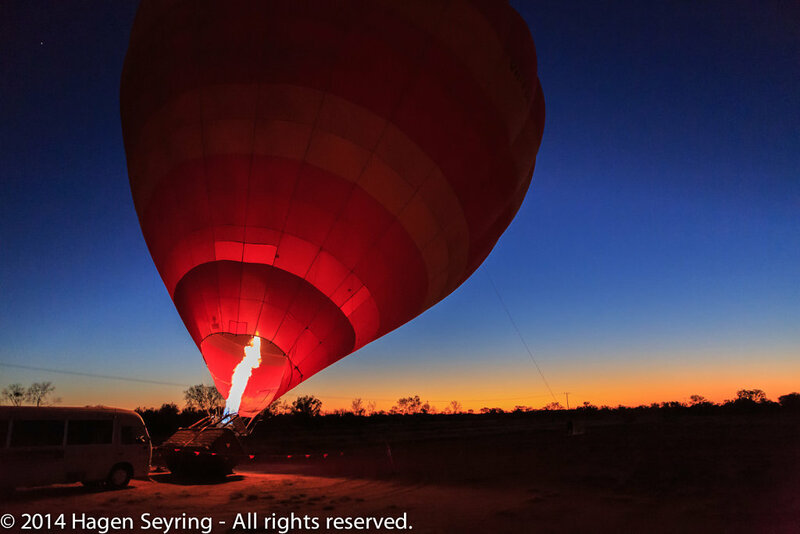 It lies 335 km (208 mi) south west of the nearest large town, Alice Springs, 450 km (280 mi) by road. 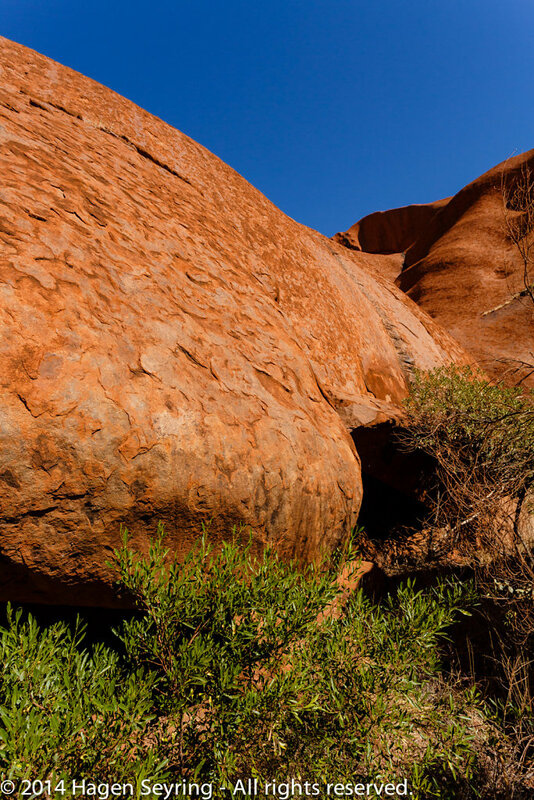 On the feet of the Uluru you will find a lot of caves with the typical aborigines paintings and drawings on the wall. 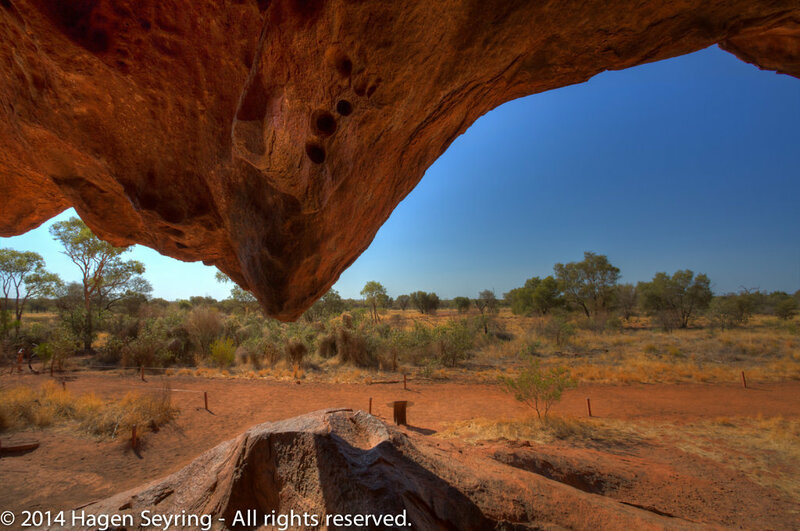 View inside from a caveUluru (English pronunciation: /ˌuːluːˈruː/), also known as Ayers Rock and officially gazetted as Uluru / Ayers Rock,is a large sandstone rock formation in the southern part of the Northern Territory in central Australia. 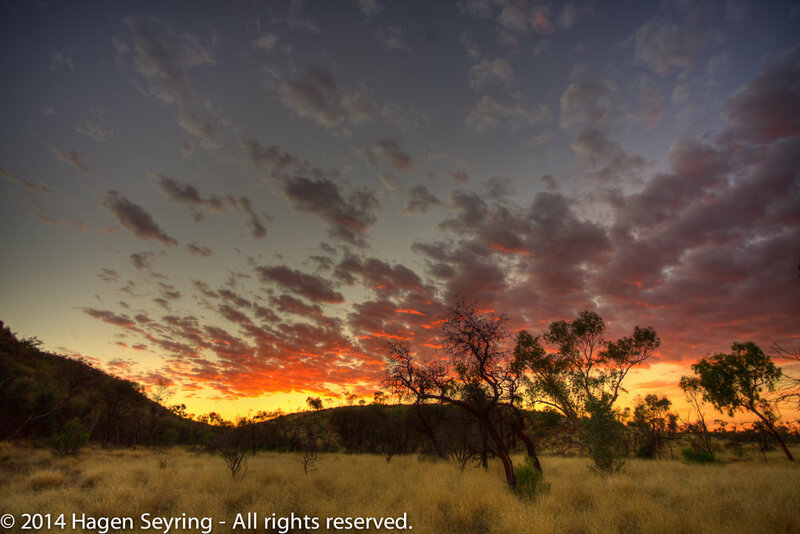 It lies 335 km (208 mi) south west of the nearest large town, Alice Springs, 450 km (280 mi) by road. The stone After the walk and a refreshment in a visitor center we were driving to a sunset viewing park place. I was a little bit terrified as I have seen hundreds of busses and cars and the people who were standing outside and waiting for the sunset with champaign and crackers. 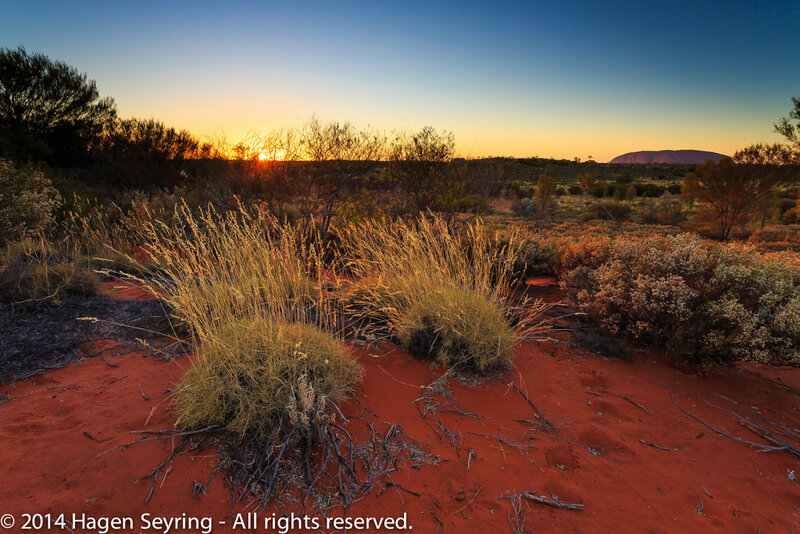 Sunset on the UluruUluru (English pronunciation: /ˌuːluːˈruː/), also known as Ayers Rock and officially gazetted as Uluru / Ayers Rock,is a large sandstone rock formation in the southern part of the Northern Territory in central Australia. 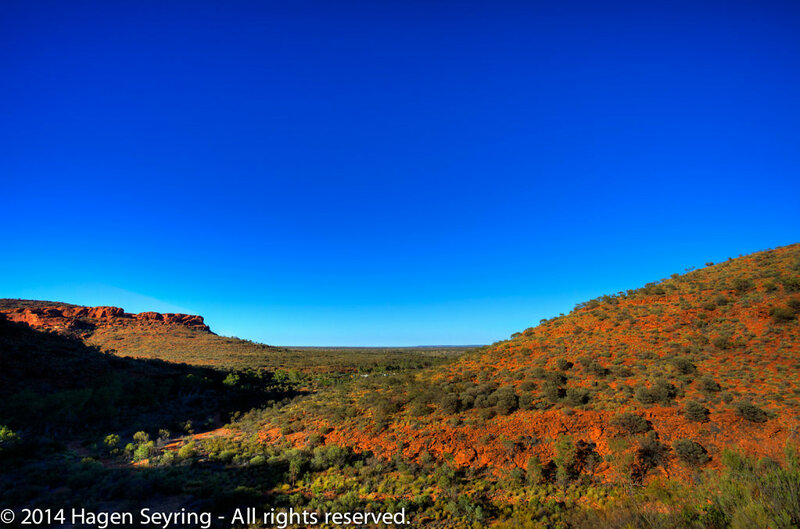 It lies 335 km (208 mi) south west of the nearest large town, Alice Springs, 450 km (280 mi) by road. Nevertheless this Day was a great experience of nature. After the dinner made from kangaroo I slept very well but only until 5 o'clock. After a really early get up at 5 o'clock and a little unsettled sleep we had a small breakfast in our campsite close to the Uluru. 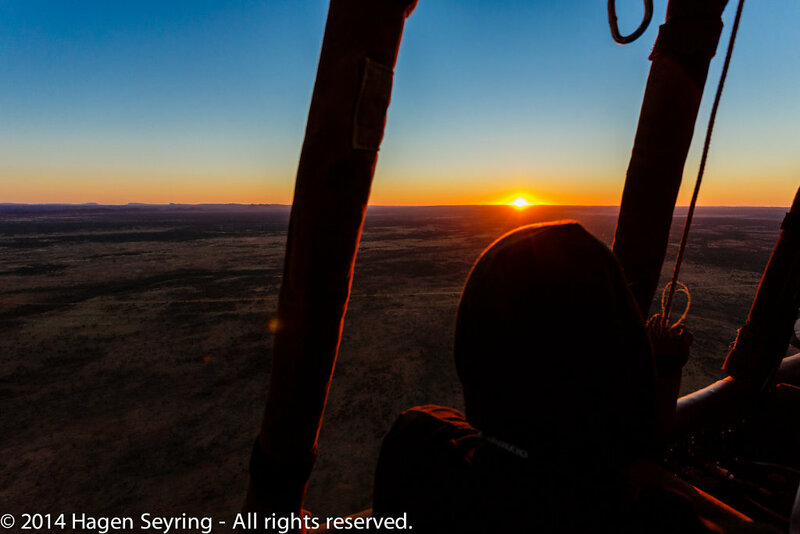 But it was it worth to get up so early then from a lookout close to our campsite the nature offers their beauty with a colourful spectacle whilst the sun rise slowly from the horizon to illuminate the Uluru with a magical light. View on a few rocks ofthe Katja TjutasKata Tjuta, sometimes written Tjuṯa (Kata Joota), and also known as Mount Olga (or colloquially as The Olgas), are a group of large domed rock formations or bornhardts located about 365 km (227 mi) southwest of Alice Springs, in the southern part of the Northern Territory, central Australia. The next stop on your trip should be Katja Tjunta. 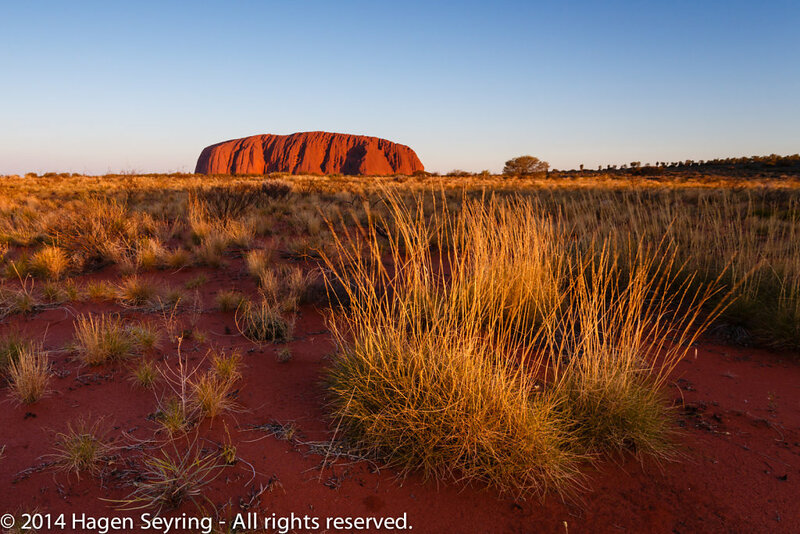 A rock which were formed in the same geologic era like the Uluru. 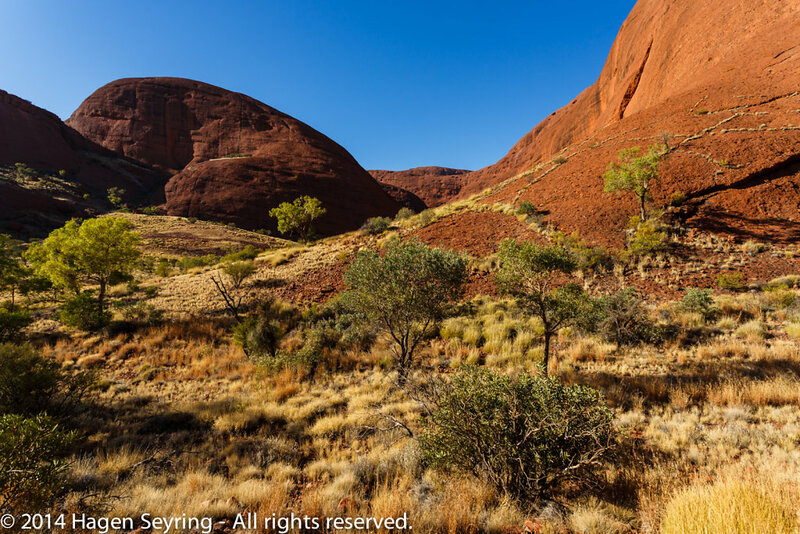 On the feeet of theKatja TjutaKata Tjuta, sometimes written Tjuṯa (Kata Joota), and also known as Mount Olga (or colloquially as The Olgas), are a group of large domed rock formations located in the southern part of the Northern Territory, central Australia. We arrived it very early in the morning, and did a 7,5 km walk around of one of the hills. View on the rocks of the Katja Tjutas from the walk around trailKata Tjuta, sometimes written Tjuṯa (Kata Joota), and also known as Mount Olga (or colloquially as The Olgas), are a group of large domed rock formations located in the southern part of the Northern Territory, central Australia. 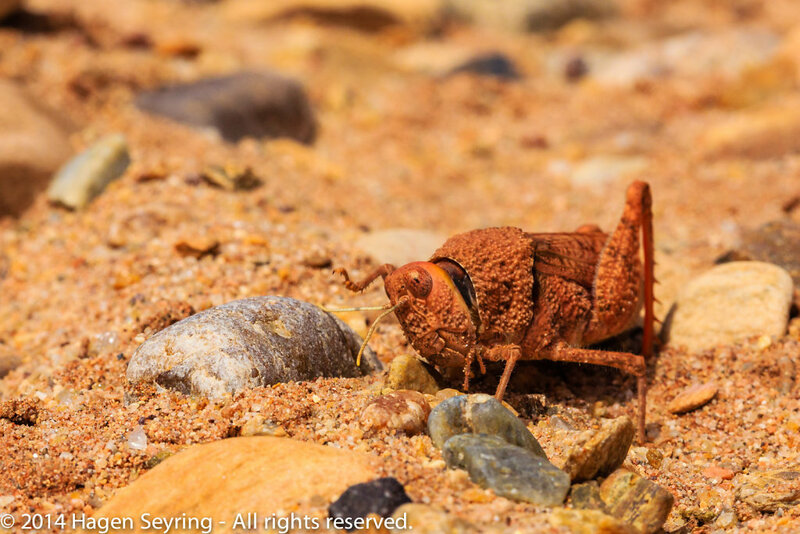 The walk along the unsealed trails covered with rocks through sparse forrest on brown soil covered with small islands of light yellow glowing gras over brown shaded rocks lightning with the early sun beams under a saturated blue sky was enchantingly. 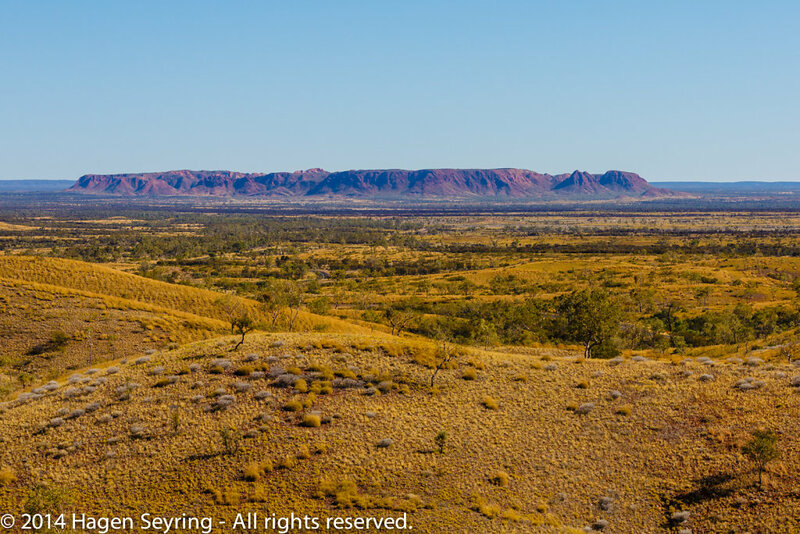 View on Mt Olga from the Katja TjutasKata Tjuta, sometimes written Tjuṯa (Kata Joota), and also known as Mount Olga (or colloquially as The Olgas), are a group of large domed rock formations located in the southern part of the Northern Territory, central Australia. So I couldn't resist to become inflamed by passion for my photography. 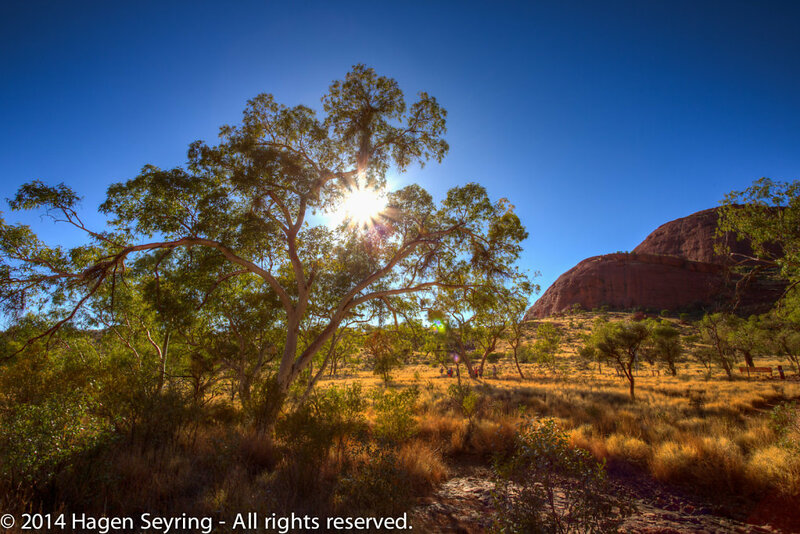 Sunrise at noonKata Tjuta, sometimes written Tjuṯa (Kata Joota), and also known as Mount Olga (or colloquially as The Olgas), are a group of large domed rock formations located in the southern part of the Northern Territory, central Australia. Afterwards we were going to the Uluru visitor and culture center for toilet, some refreshings and lunch. There were also a galley where it was possible to bey some aboriginal arts. The next goal for this day was to arrive our campsite close to the Kings Geek Station. 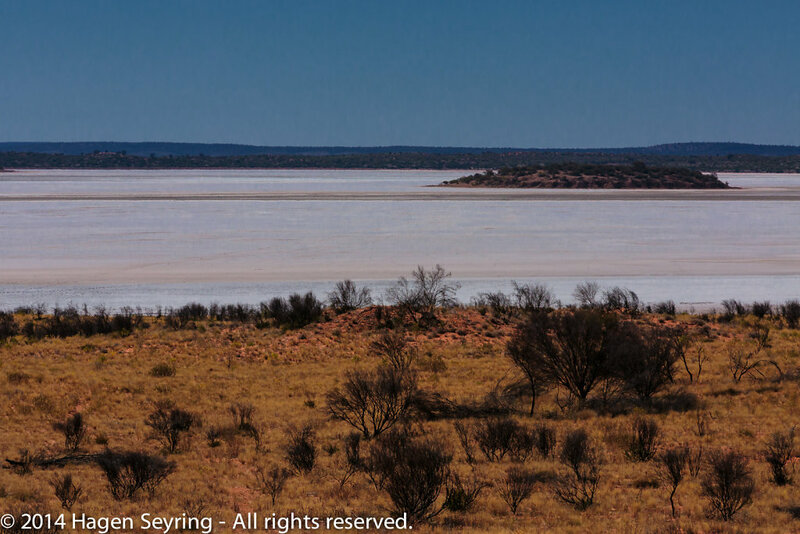 We made a stop on the Lasseter Highway on a dried-out salt lake sea. It was an amazing view over an endless landscape. I have never seen that before. Around the sunset we arrived the Kings Greek Station. Our campsite was deep in the bush. But as we have arrived, there were still visitors there. Two camels were standing between our tents. The whole group was excited. After the sunset we had dinner which was cooked on a bonfire and a beer under a stary night. Canyon Rim WalkThe six km (loop) Kings Canyon Rim Walk traces the top of the canyon and takes three to four hours to complete. After get up early like always the last days, I have experienced a wonderful sunrise like always with the colorful play of the nature in the outback again. 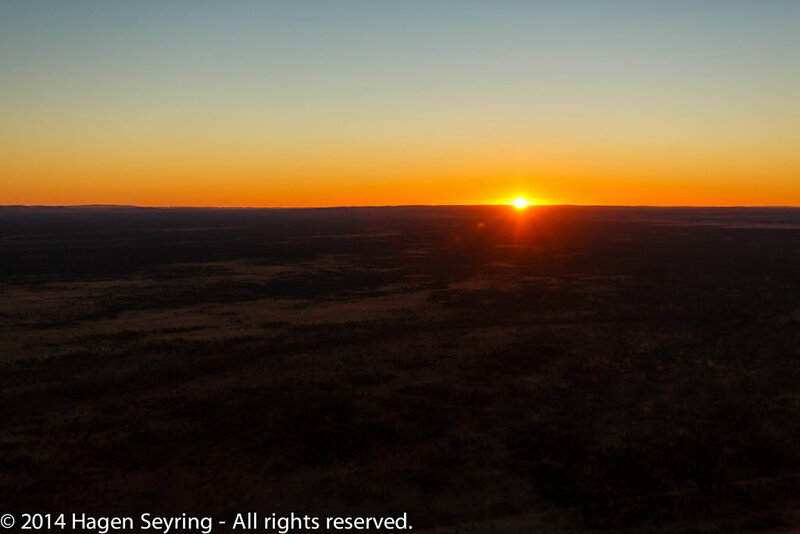 Sunrise at our campsite in Kings Greek StationKings Creek Station is a working cattle/camel station with facilities for camping, accommodation and an opportunity to experience the outback either by quad (4 wheel motorbike), helicopter or camel. 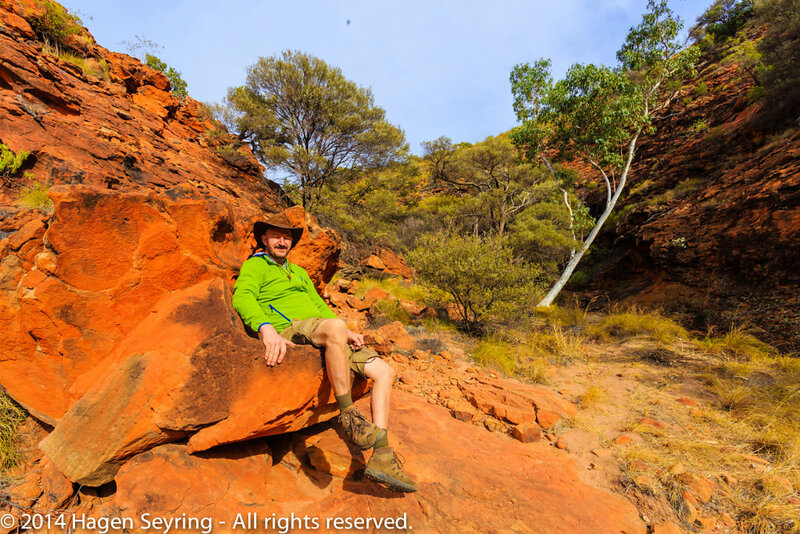 Our goals for today should be the Kings Canyon and Glen Helen in the MacDonnel Ranges. The first stop after app. an hour drive was the famous Kings Canyon. We arrived it in the early morning I think at 8 O'clock. But it was a good time, then the Canyon Rim Walk will be closed in the afternoon often, because of the strong heat on the plateaus in the afternoon. So we were asked to take at least 1,5 l water with us. 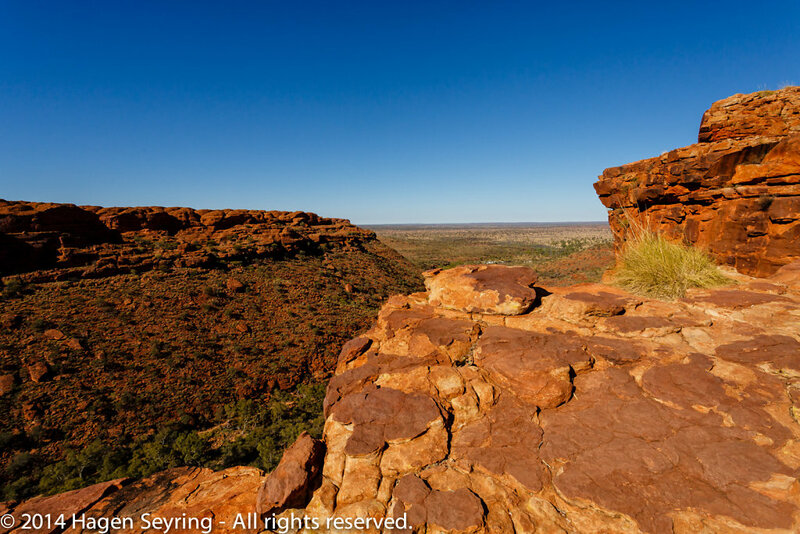 The six km (loop) Kings Canyon Rim Walk traces the top of the canyon and takes three to four hours to complete. 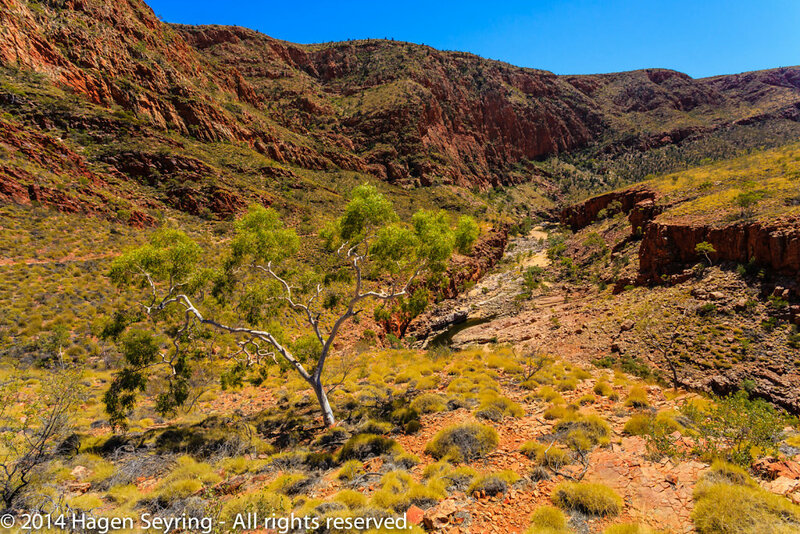 View from Kings Canyon over the bush landPart of the gorge is a sacred Aboriginal site and visitors are discouraged from walking off the walking tracks. A steep climb at the beginning of the walk, which locals call "Heartbreak Hill" (or "Heart Attack Hill", due to its steepness), takes visitors up to the top, with spectacular views of the gorge below and of the surrounding landscape. 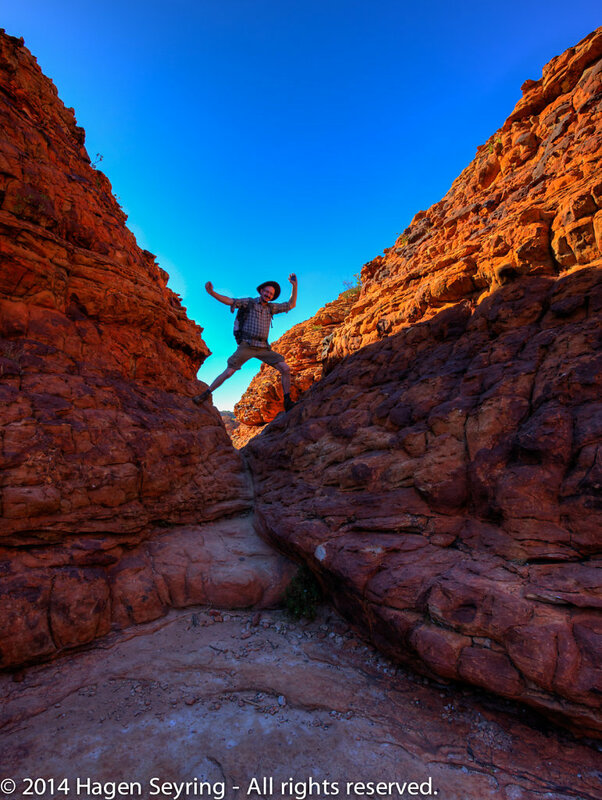 Climbing to the Kings CanyonThe walls of Kings Canyon are over 100 metres high, with Kings Creek at the bottom. 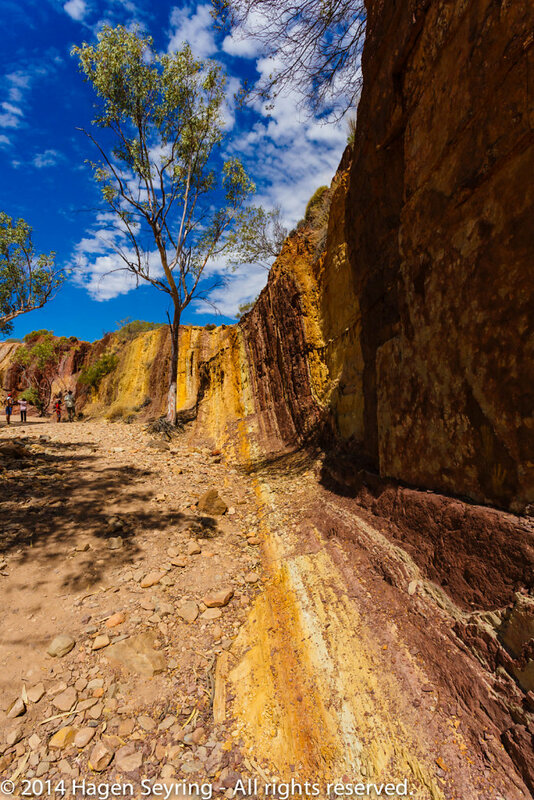 Part of the gorge is a sacred Aboriginal site and visitors are discouraged from walking off the walking tracks. After passing a beautiful plateau we hat to go through a small crack, called the Priscilla Crack. Through this crack the three drag queens in the movie "Priscilla - Quenns of the desert" had to climb to achieve the top of the Kings Canyon. Priscilla Crack in the Kings CanyonThrough this crack the three drag queens in the movie "Priscilla - Quenns of the desert" had to climb to achieve the top of the Kings Canyon. About half way during the walk, a detour descends to Garden of Eden, a permanent waterhole surrounded by lush plant life. The last half of the walk passes through a large maze of weathered sandstone domes, reminiscent of the Bungle Bungle. A slow descent brings the visitor back to the starting point. After the Kings Canyon we had to drive over the 93 km long Mereenie Loop Road, which is the shortest way from Uluru to the Glen Helen in the MacDonnel Ranges. Mereenie Loop RoadThe unsealed Mereenie Loop Road lets you drive directly from Kings Canyon (Watarrka National Park) to the West MacDonnell Ranges - or the other way round - without backtracking. It was a really amazing experience to drive with an 4WD car over a red colored wide runway over a so long distance. 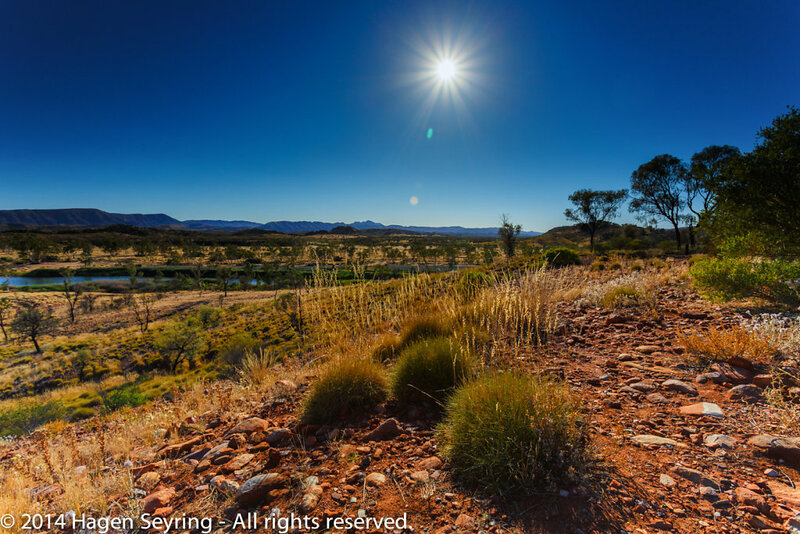 The unsealed Mereenie Loop Road lets you drive directly from Kings Canyon (Watarrka National Park) to the West MacDonnell Ranges - or the other way round - without backtracking. It is a lovely drive through some beautiful desert country, certainly more appealing than the much longer detour along the sealed highway. At the end we arrived the Glen Helen. 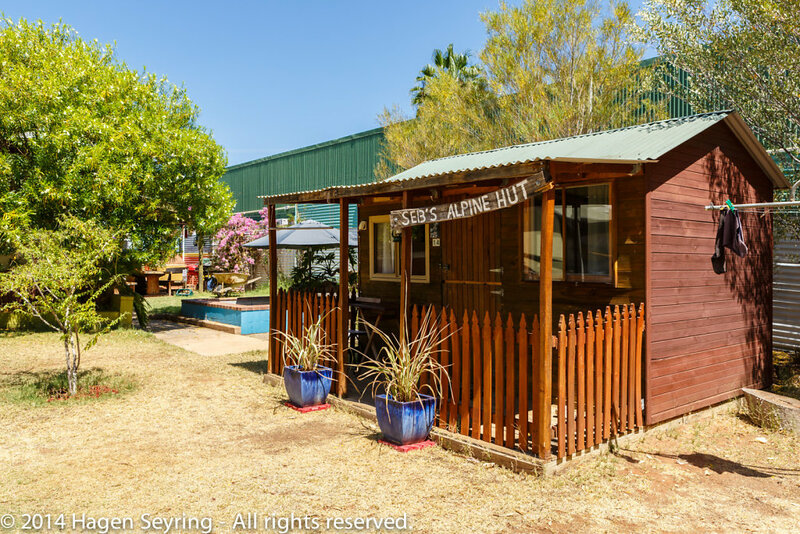 Glen Helen ResortFor camping, backpackers or motel guests, adventure holidays or a relaxing drive, Glen Helen Resort can cater to all styles of self drive holidays in the red centre. 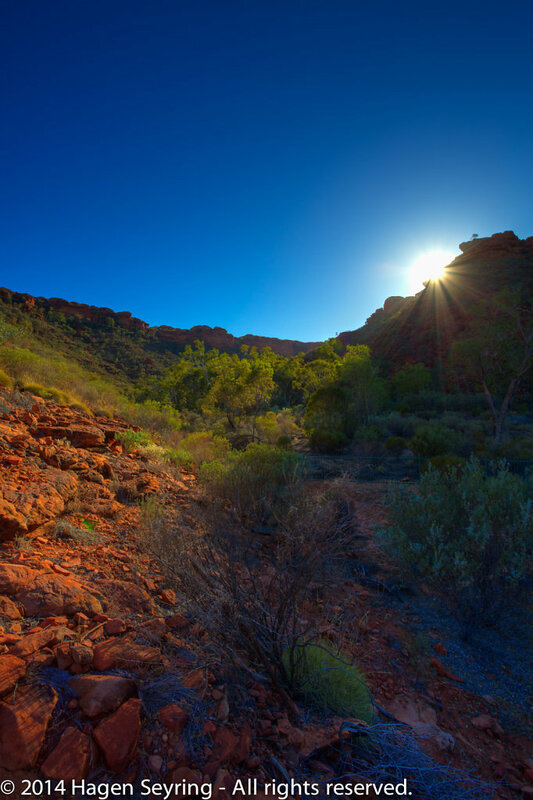 Glen Helen is surrounded by the majestic MacDonnell Ranges, and is a destination in its own right, with easy day trip access to the whole West MacDonnell National Park, including Palm Valley, Hermannsburg, Ormiston Gorge, Redbank Gorge and Mt Sonder. Our tour guide cooked potato gratin, steak and salad for dinner. Rocks formation in the morning at Glen HelenGlen Helen was formally a cattle station but is now a tourist resort that caters to visitors that want to truly immerse themselves in the West Macs. Part of the former Glen Helen Station still exists, west of Redbank Gorge. The day started early at 5:30 o'clock again. But the advantage of this is that you have the chance of a beautiful sunrise. 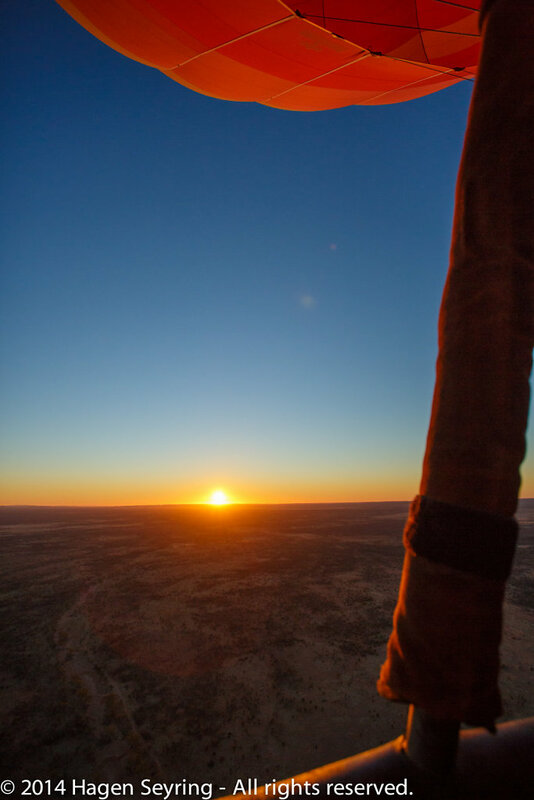 And the sunrises in the outback are always amazing. So my first step, you can imagine was to pick up my camera bag und to go to the beautiful cliff I have been in the evening yesterday. And I guessed the early sunset beams were setting it in a warm magnificent light. 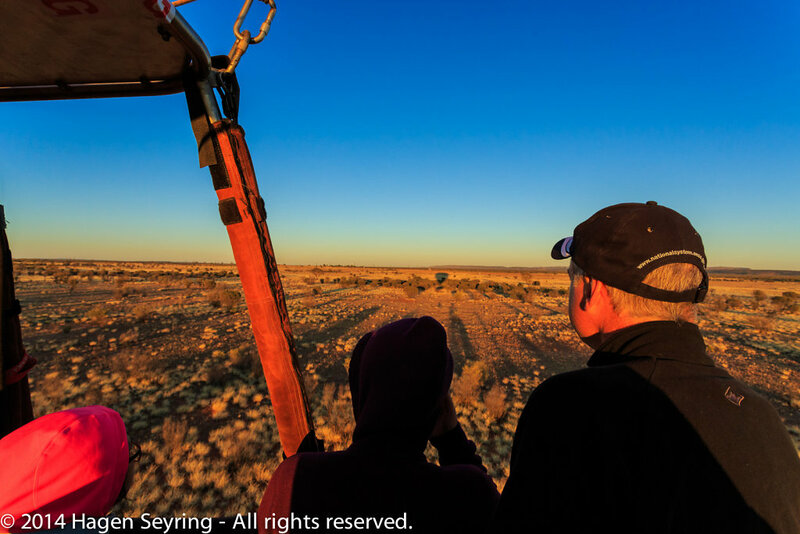 with their comfortable pub, nice staff and beautiful surroundings and went to the Mt Sonder Lookout, from which we had a wonderful view over the plateau of the MacDonnel Ranges, which were framed from the two mountain range. Sunrise in the MacDonnel RangesThe MacDonnell Ranges, an interim Australian bioregion, are located in the Northern Territory, and are a 644 km (400 mi) long series of mountain ranges located in the centre of Australia, and consist of parallel ridges running to the east and west of Alice Springs. This day should become the day of the gorges. Then the MacDonnel Ranges offered a lot of them. If you want to get more information click here. 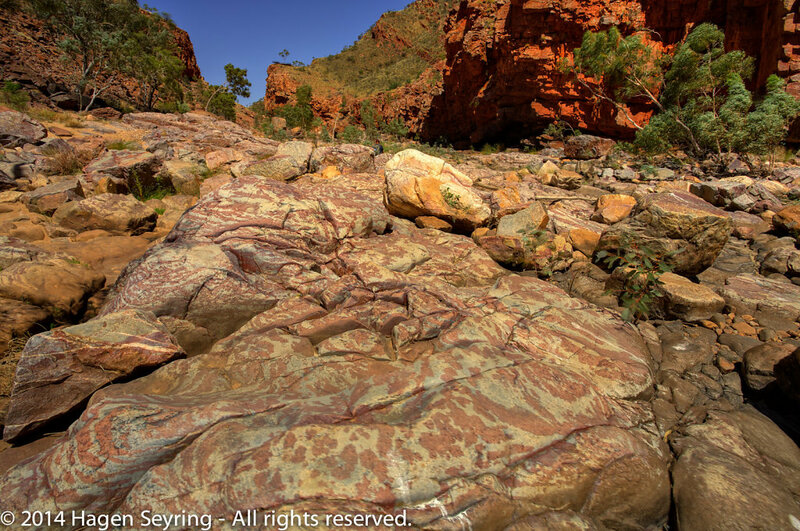 The first step on our daily tour should be the Redbank Gorge which we reached after an half an hour drive over a sealed and unsealed road. We did there a 30 minute walk through a beautiful dried-out river bed which was covered with majestic gum trees in a warm sunlight. Dried-out river on the way to Redbank GorgeRedbank Gorge (Rwetyepme, pronounced 'roo-chip-ma') is a stunning gorge and chasm that is a refuge for many threatened plant and animal species. 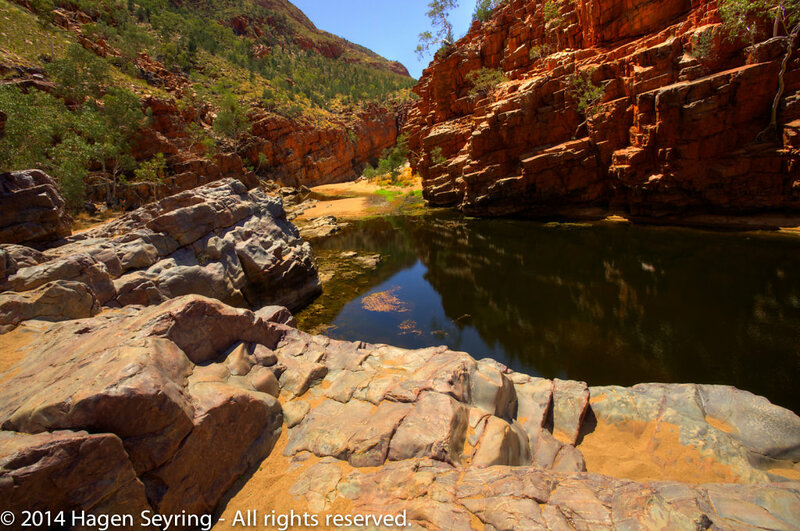 Finally we get the tight steep gorge with a waterhole on the ground, in where some of our group took a swim. Afterwards we were going to our second gorge, the Orminston Gorge. It was for me the most beautiful of this day, because it was so varying. 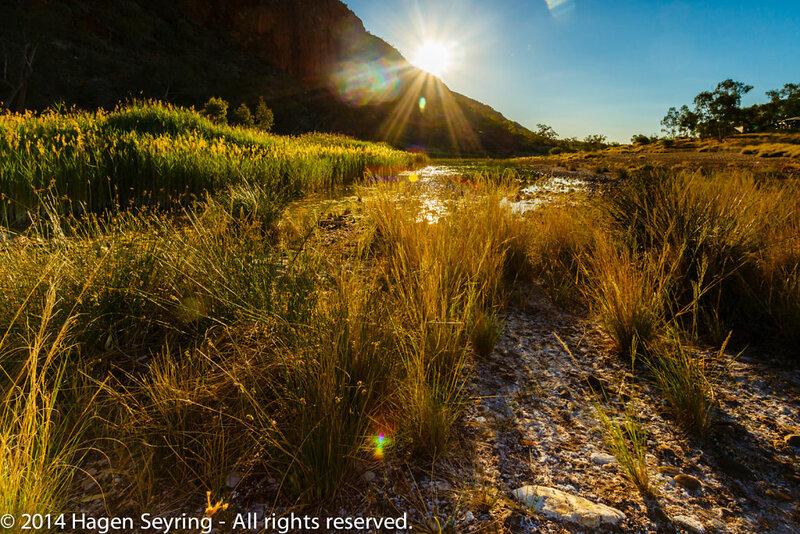 View in the Ormiston GorgeOrmiston Gorge offers visitors all the spectacular geology and landforms of the MacDonnell Ranges. 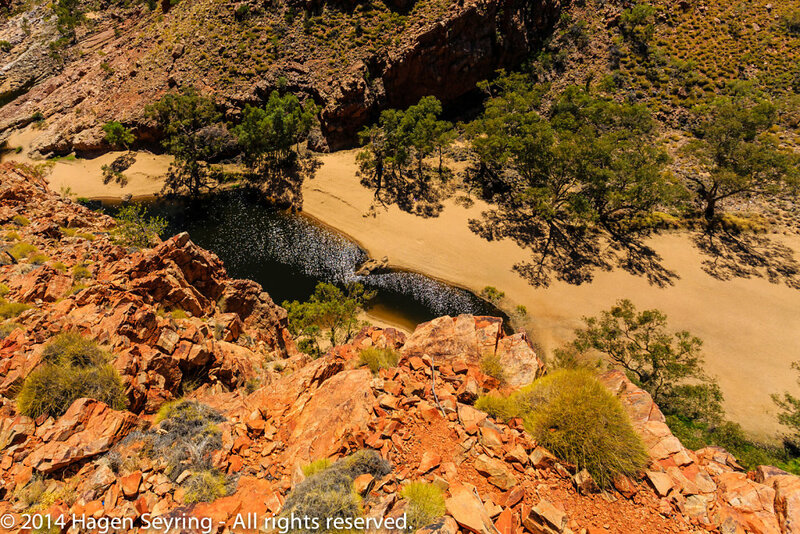 The rugged scenery of the the Gorge is complemented by a near-permanent water hole. We were walking on the Ghost Gum Walk which leads us at first over a steep but short climbing on a top with a spectacular lookout over the valley with the mountain crest in the background. View from the highest point of the Ghost Gum Walk in the OrmistoGhost Gum Walk takes about 15 - 20 minutes and winds down to the edge of Roe Creek. 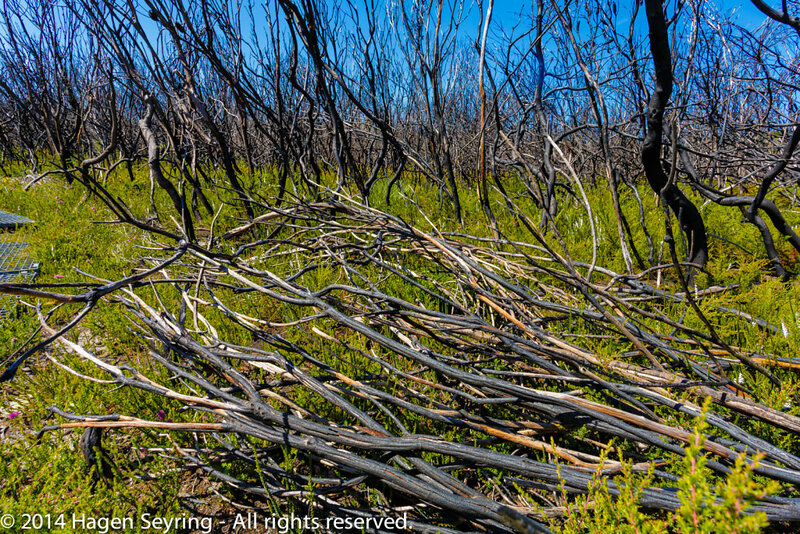 Starting at the Visitor Centre, this walk illustrates the native plants of the area including an ancient huge Ghost Gum. The trail leads us on a slightly scoping way to the base of the gorge where a waterhole was located. 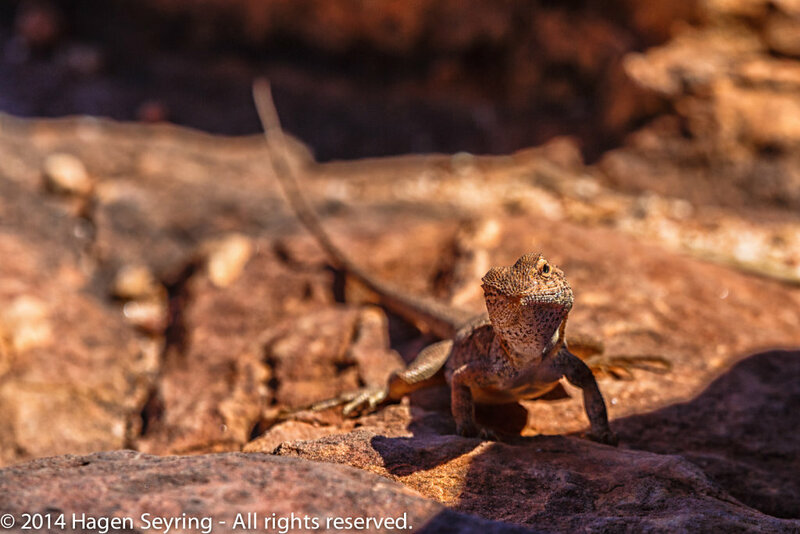 On the ground of the Ormiston GorgeThe water and the shelter of the rocks attract an interesting variety of native fauna and flora, including a number of relict plant species. Rock formation in the Ormiston GorgeMassive geological forces created the towering red walls of Ormiston Gorge and Pound, located within the West MacDonnell National Park, 135 kilometres west of Alice Springs. 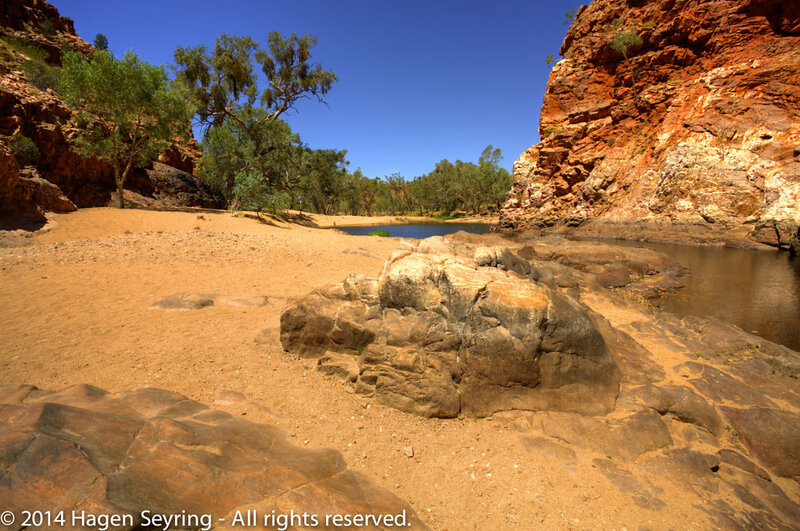 to a sandy river food plain with a waterhole again where some of our members of the group took a swim. 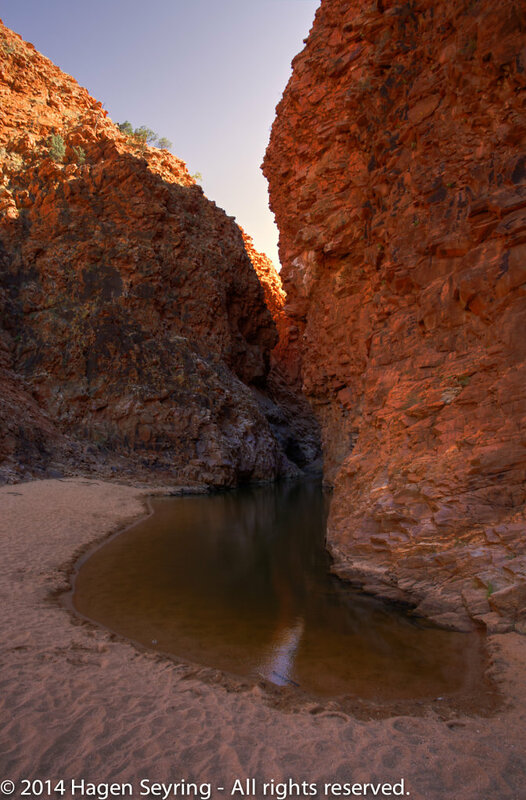 Waterhole in the Ormiston GorgeWithin the gorge is a permanent waterhole, estimated to be at least 14 metres deep, which provides a refreshing finale to a day's exploring. On the picnic area of the Orminston Gorge Kathy prepared a lunch for us s always delicious. The next stop of our daily tour shouldn't be a gorge but a Ochre Pit. Layers of different collors of sandstone in the Ochre PitsThe pits consist of several layers of multi-coloured, layered rock that was traditionally used by Australian Aborigines in ceremonies and played an important role in the continent's economy, being traded with neighbouring clans and "countries", in every direction on the continent. I think the most of my readers don't know what a Ochre Pit is like I didn't know it before to. 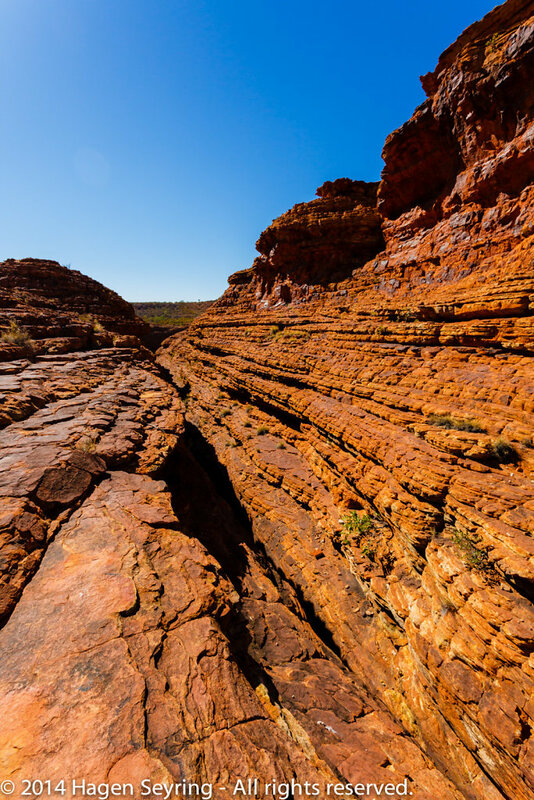 The pits consist of several layers of multi-coloured, layered rock that was traditionally used by Australian Aborigines in ceremonies and played an important role in the continent's economy, being traded with neighbouring clans and "countries", in every direction on the continent. 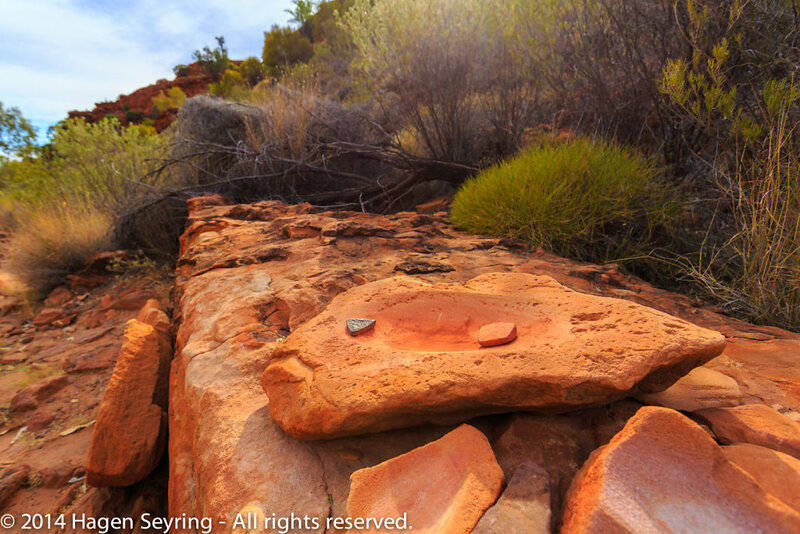 Ochre has always been an important part of Aboriginal culture and a vital part of everyday life. 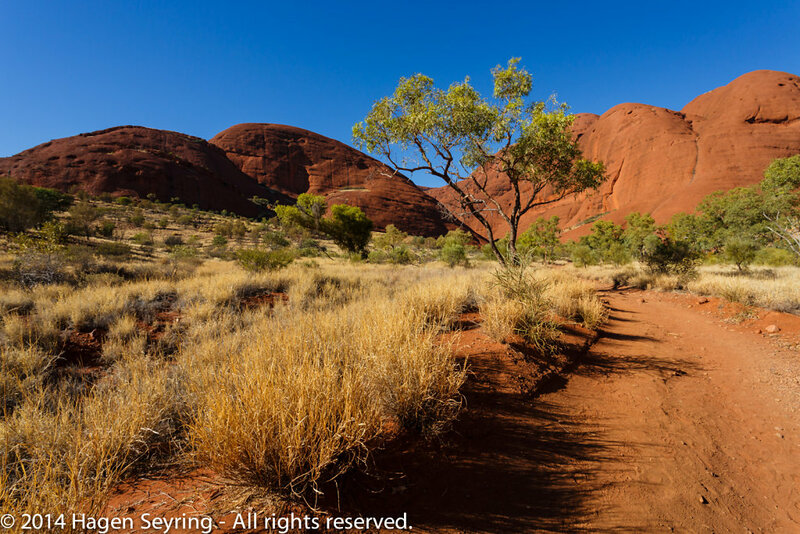 For medicinal purposes red ochre can be mixed with grease and applied as an ointment and to relieve decongestion when mixed with eucalyptus leaves. White ochre was used as a magical charm, when mixed with water and blown from the mouth it is believed to abate the heat of the sun or the force of the wind. Weapons were painted with ochre to increase the success of hunting. It also protected the wooden weapons from termites. 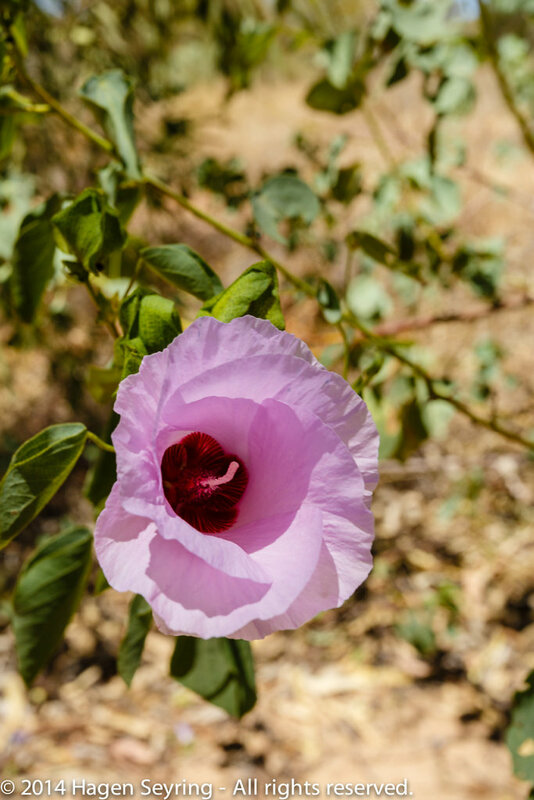 Rose of desertThe desert rose (Adenium obesum) is a striking plant with swollen succulent stems and deep red flowers. The last gorge of the day which we visited was the Everly Greek Hole. 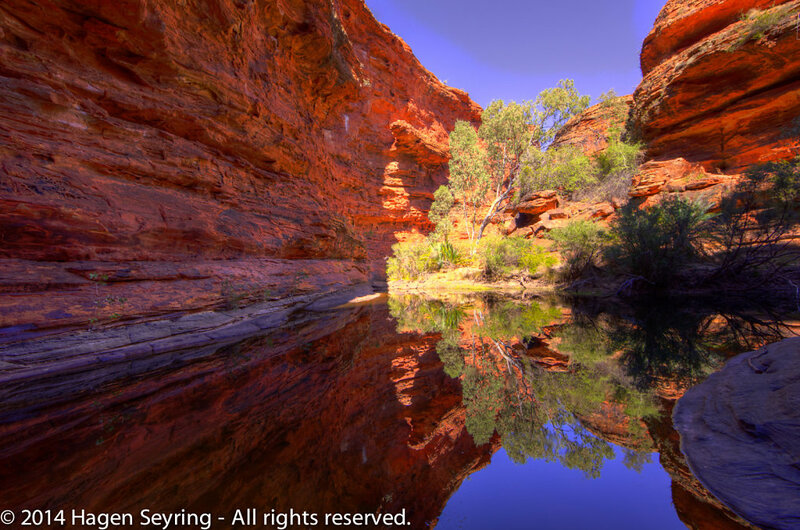 View in the Ellery Greek WaterholeHigh red cliffs, a large waterhole and a sandy creek fringed by gums make this one of the most popular and picturesque picnicking spots in the West MacDonnell Ranges. Because of the heat of the day a few people of our group were taking a swim the waterhole. On a parking site some members of our group left us because the had booked only a four day trip. The rest of the group stayed overnight deep in the Bush. 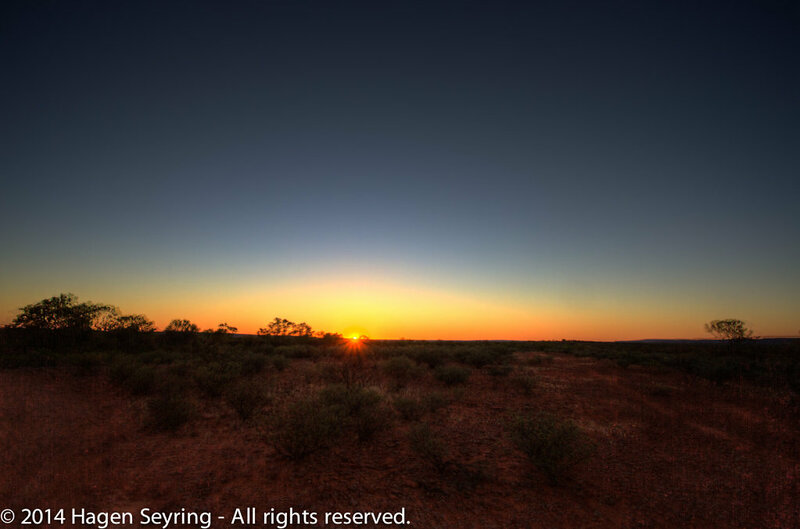 Sunset over the deepest outback close to the Hugh riverThe Outback is the vast, remote, arid area of Australia. 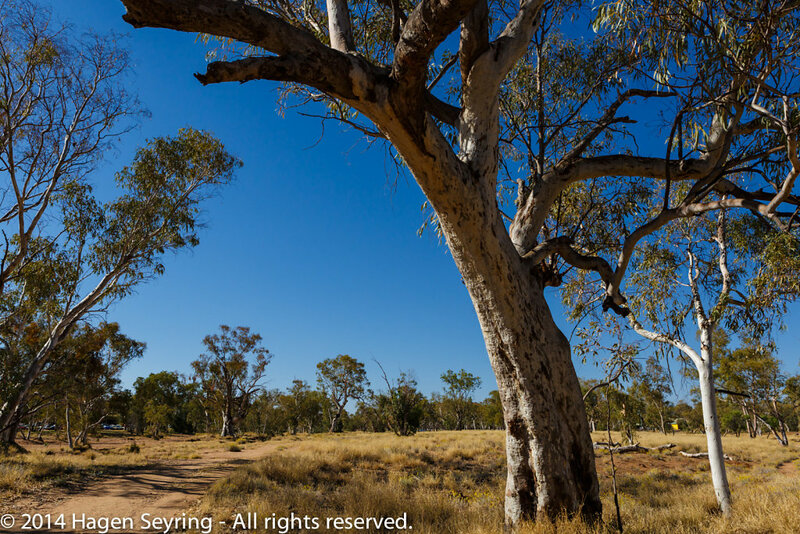 The term "the outback" is generally used to refer to locations that are comparatively more remote than those areas named "the bush" which, colloquially, can refer to any lands outside the main urban areas. 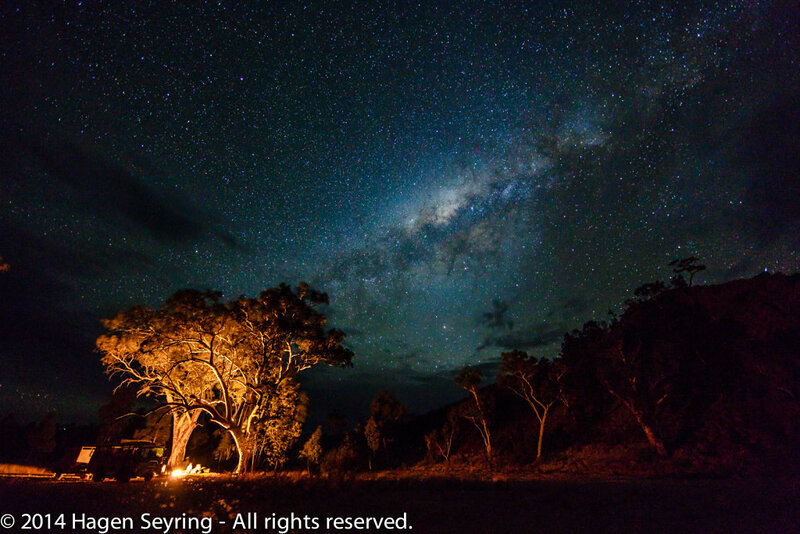 under a sky of millions of stars of the milky way very well. 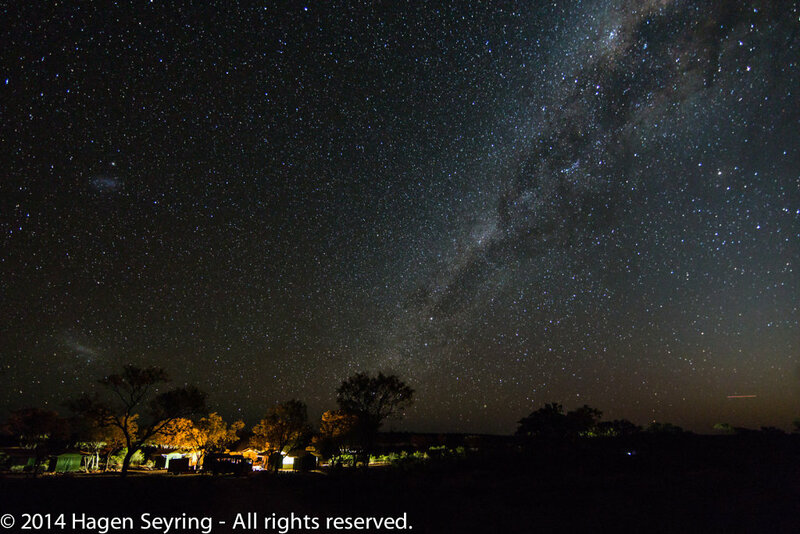 Our campsite under the milky wayThe last night of our outback tour we were staying only with our sleepsacks and a bonfire in the deep bushland. It was an experience I will never miss. Sunset at our last campsite in the bush..
After a little unsettled night in the swag, we were waken up from our tour guide really early again. But as a compensation a amazing sunrise in the bush land expected us. We didn't have breakfast at our campsite, but we went very shortly to Wallace Rockhole an Aboriginal Community to have our morning toilet and our breakfast there. 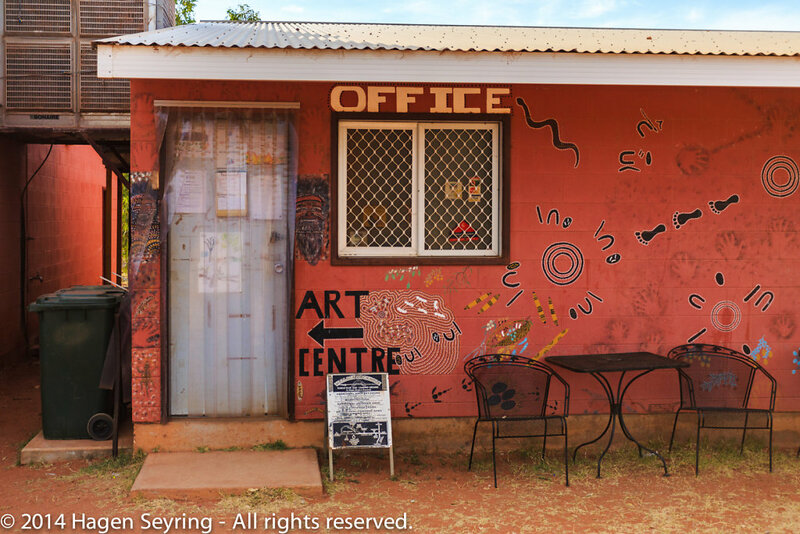 Art center in Wallace RockholeWallace Rockhole is on the Urana Land Trust 25kms along the James Range and 40kms to the West MacDonnell Ranges. Afterwards an aboriginal man guided us through the not far away located gorge and explained us different tools which were used from the former aboriginals who have lived in this area. Aboriginal tools in Wallace RockholeAboriginal Australians, also referred to as Aborigines, are legally defined as people who are members "of the Aboriginal race of Australia" (indigenous to the Australian continent—mainland Australia or to the island of Tasmania). 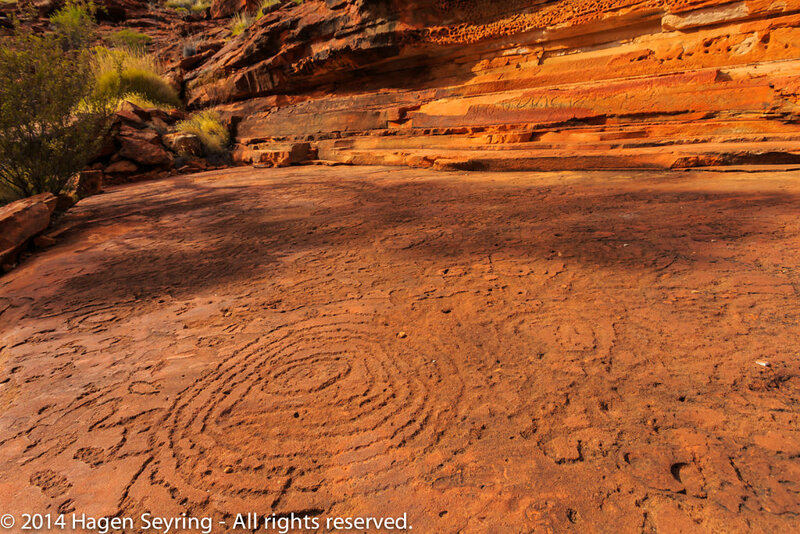 And he described also the meaning of the engraved patterns in the brown sandstone, which regularly were used as maps from the area from generation to generation and showed waterholes (circles) for instance. 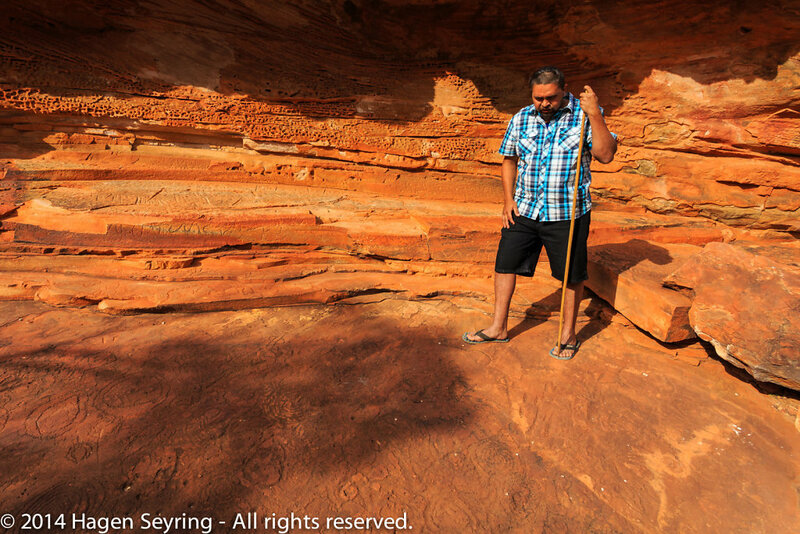 Aboriginal tour guide explaning the map craved in sandstone in Wallace Rockhole Wallace Rockhole in the West MacDonnell Ranges. 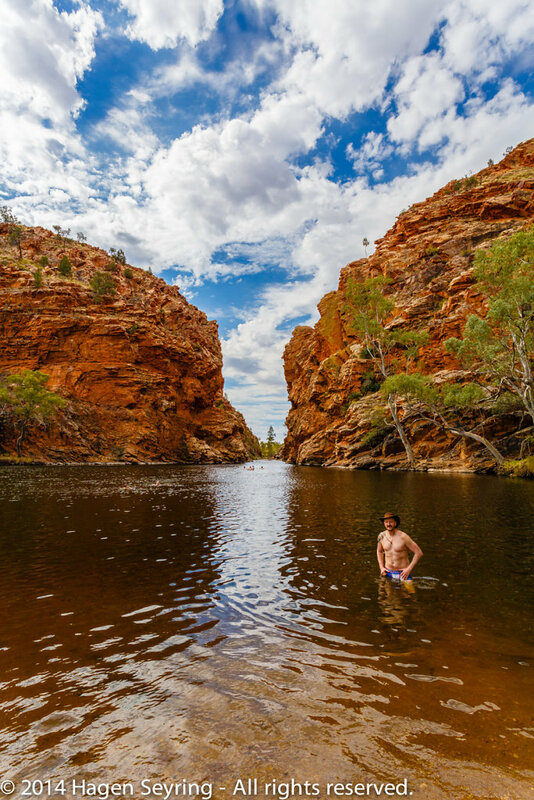 Wallace Rockhole is a Western Aranda Aboriginal Community located 120kms west of Alice Springs along the James Range. Engraved map in sandstone close to Wallace RockholeWallace Rockhole is a Western Aranda Aboriginal Community located 117kms west of Alice Springs along the James Range. In the community room one female aboriginal artist were painting a picture in the typical aboriginal way. Aboriginal artist in Wallace RockholeIndigenous Australian art or Australian Aboriginal art is art made by the Indigenous peoples of Australia and in collaborations between Indigenous Australians and others. 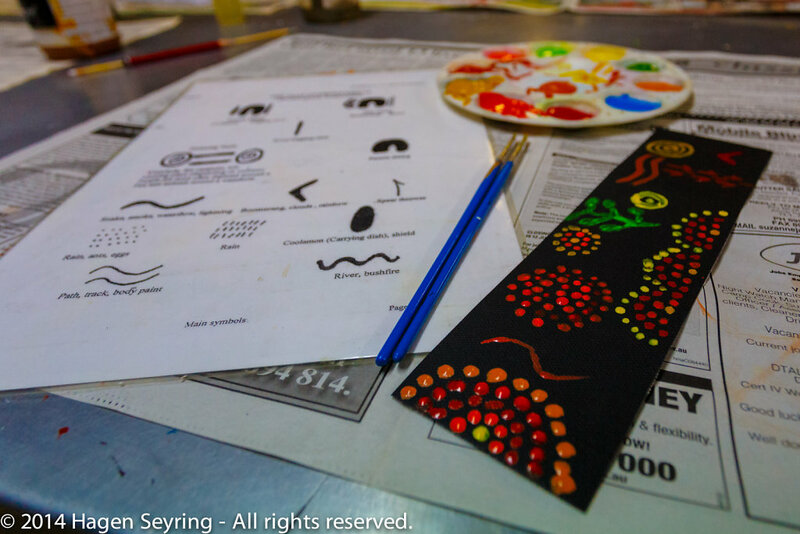 After that we attended the Art Culture Center there to watch a movie about the history of the Aboriginals in this land and we tried to paint some aboriginal arts too. I guess it was mor an trial than a success. But In my eyes it wasn't so bad. 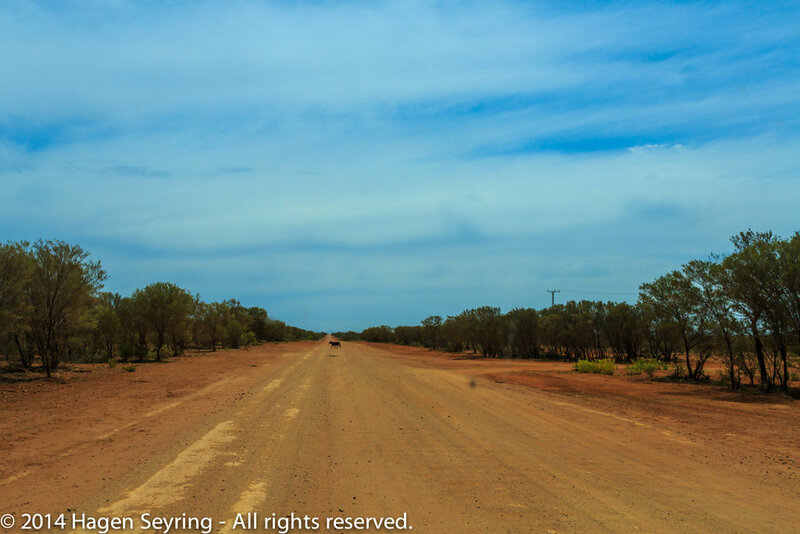 Unsealed street with a cattle in the outbackAustralian cattle stations (ranches) are often mentioned in the same breath as the Australian Outback. 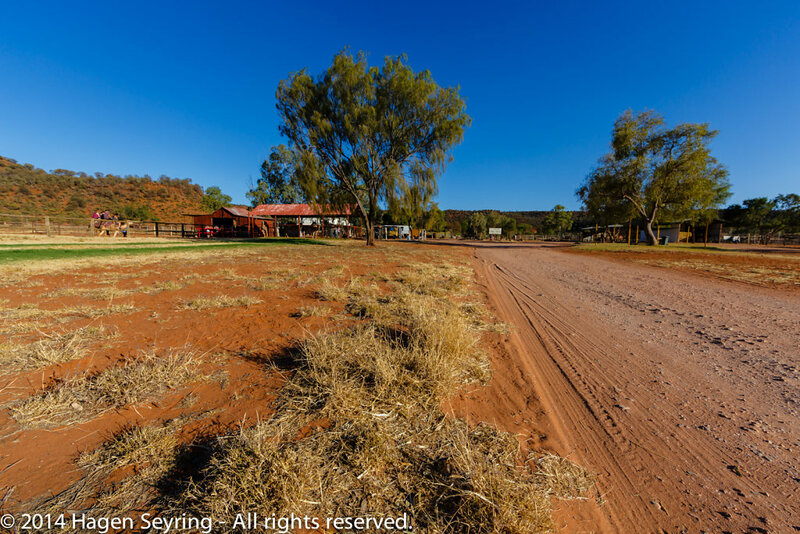 For many people life in the Australian Outback is synonymous with living and working on an Outback cattle station. 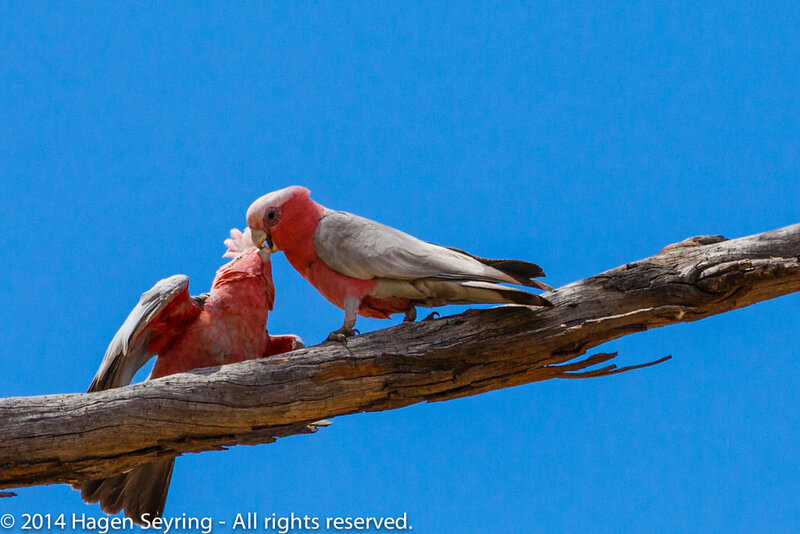 Galahs in the outbackThe galah Eolophus roseicapilla, also known as the rose-breasted cockatoo, galah cockatoo, roseate cockatoo or pink and grey, is one of the most common and widespread cockatoos, and it can be found in open country in almost all parts of mainland Australia. Grashopper on our last lunch breakThe grasshopper is an insect of the suborder Caelifera in the order Orthoptera. 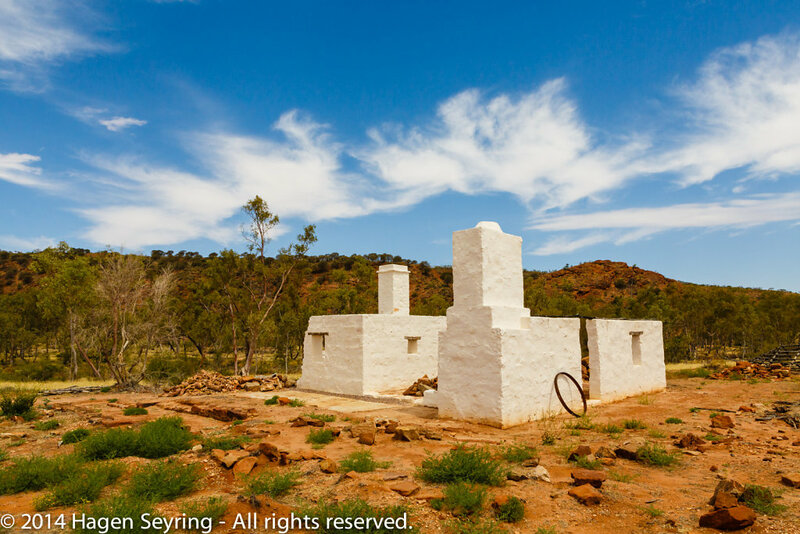 Owen Springs cattle stationThe Old Owen Springs Homestead was the first station homestead built in Central Australia. 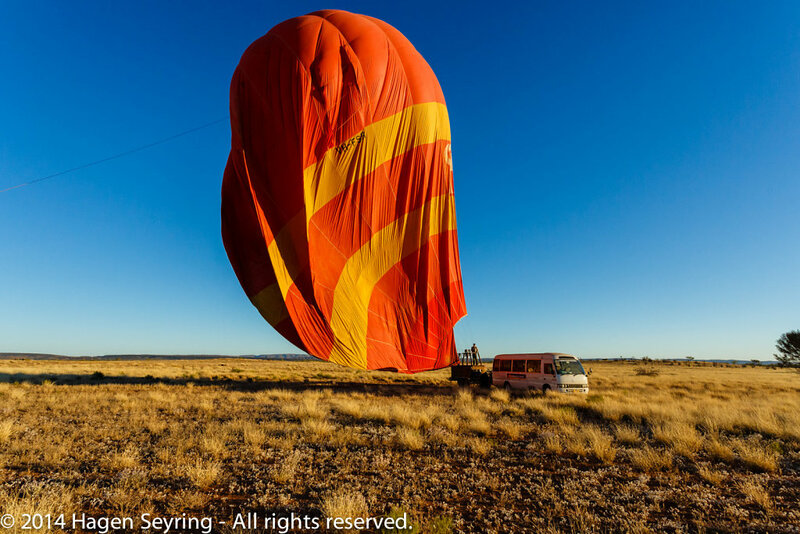 our trips leads us back to Alice Springs, which arrived in the late afternoon exhausted but satisfied full of impressions. 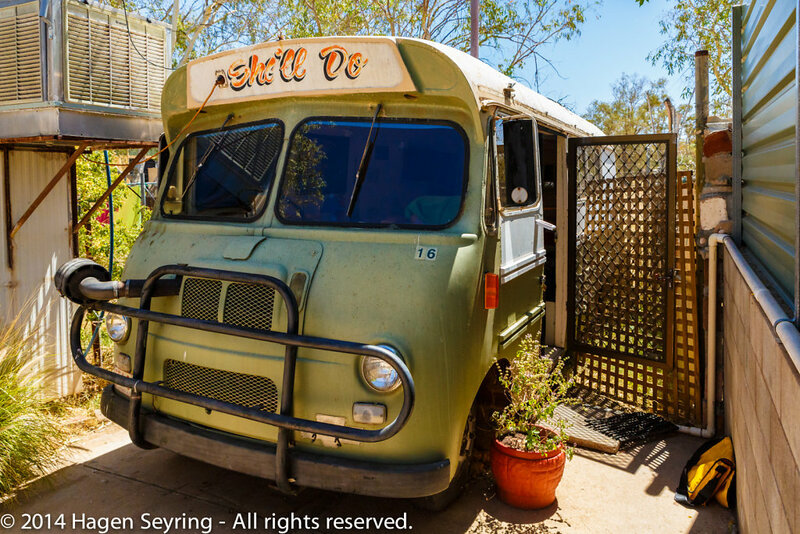 Because of the 5 day trip through the outback I rested the last day in the Alice Secrets Hostel and did nothing important except that i talked with a dutch guy a lot. He asked me of a cable to download his photos from his camera, because his sd card weren't working on his computer. But the card wasn't working in his camera too, so he had a problem. Then on this card were all his photo he has taken in Indonesia. And he did very good photos, because he showed me some on his computer. I thought he has gat a talent to portrait people. His photo of people in Thailand were very good. So we get into a long conversation about photography, photos, techniques, policy, travel, and the sense of life. Its funny, then I was a little bit annoyed about him as i have arrived the hostel and he was skyping very loud in the kitchen of the hostel. And its interesting how you can build an opinion only from one meeting of an other human being and then it is your brain. So what i have learned, give everyone a second chance. The conversation with him was really fine ;-). 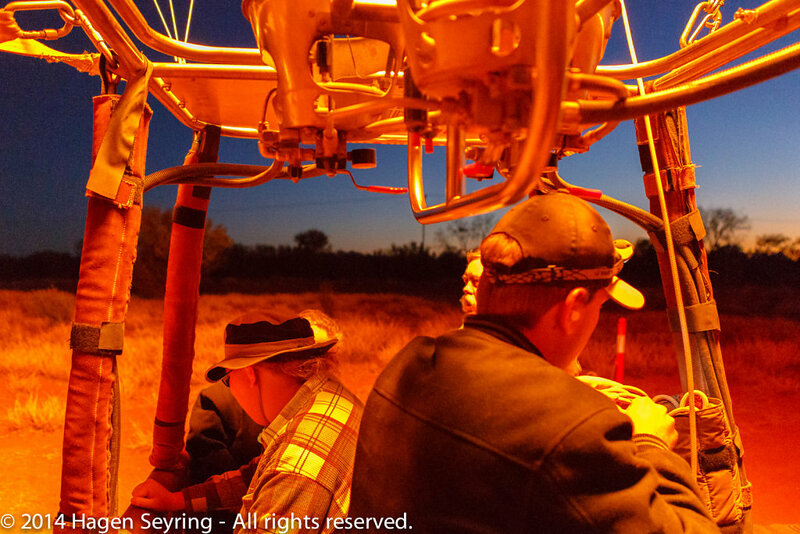 So this day i had to get up really early at 3:30 o'clock to experience my first balloon flight. 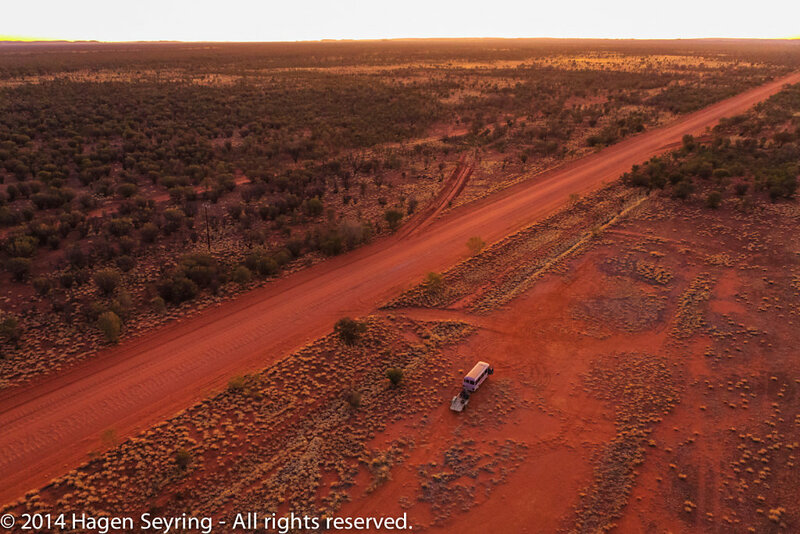 I was picked up from the crew from my hostel and after we have picked up the other passengers we went with the bus approximately 15 km form Alice Springs away. At first the balloon was inflated with a fan. 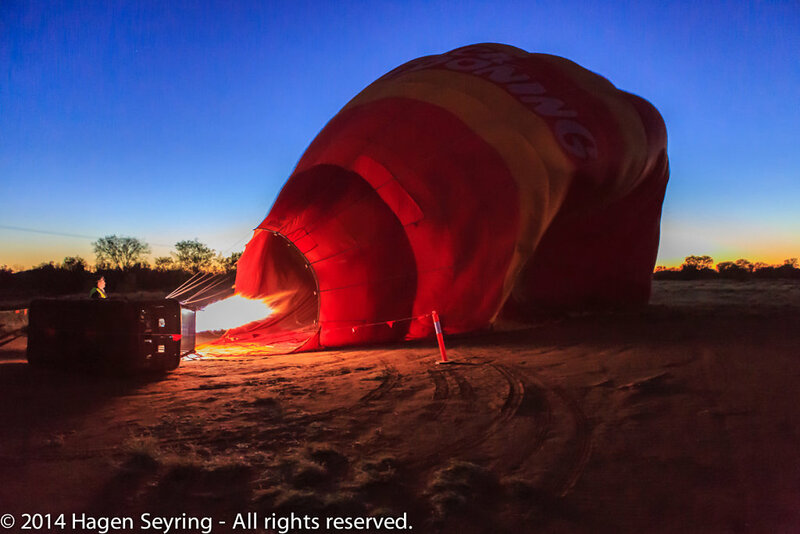 After the balloon was inflated, there air in the balloon was heating up with a gas burner. 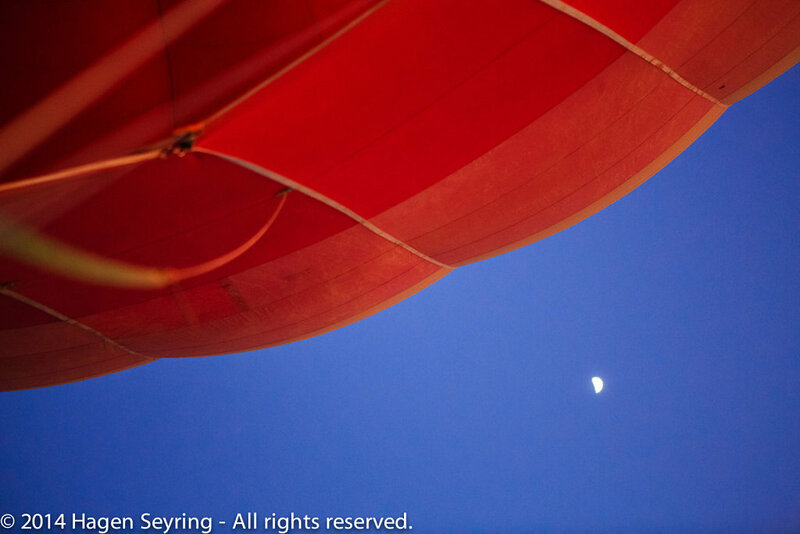 After a few minutes the hot air in the balloon was lifting it up. Out balloon pilot had a pile of things to do until we were floating against the sky in this cold early morning. 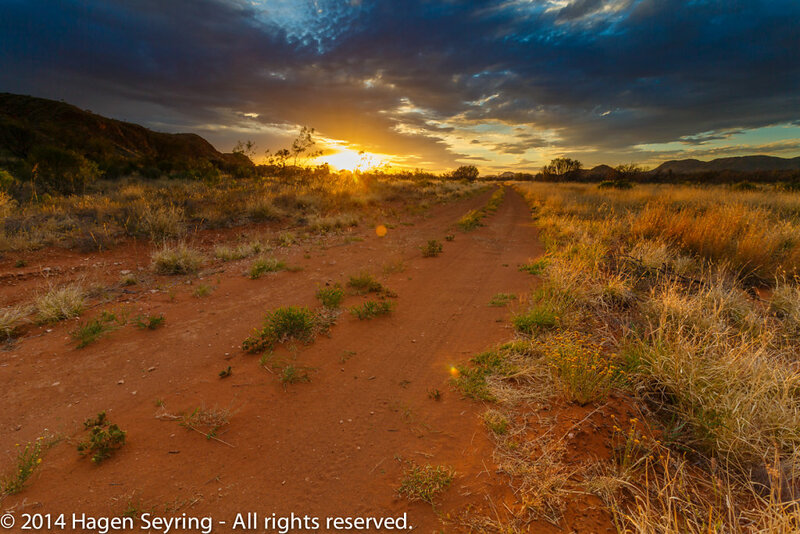 And at once we had the the landscape to the outback in Alice Springs to our feet. It was a really impressionable feeling to float loudness through the morning air only interrupted by the gas burner. and touched the surrounding landscape in warm beautiful light. All the passengers were impressed from this performance very much. But after a half of an hour it was time to land again safety in the desert.